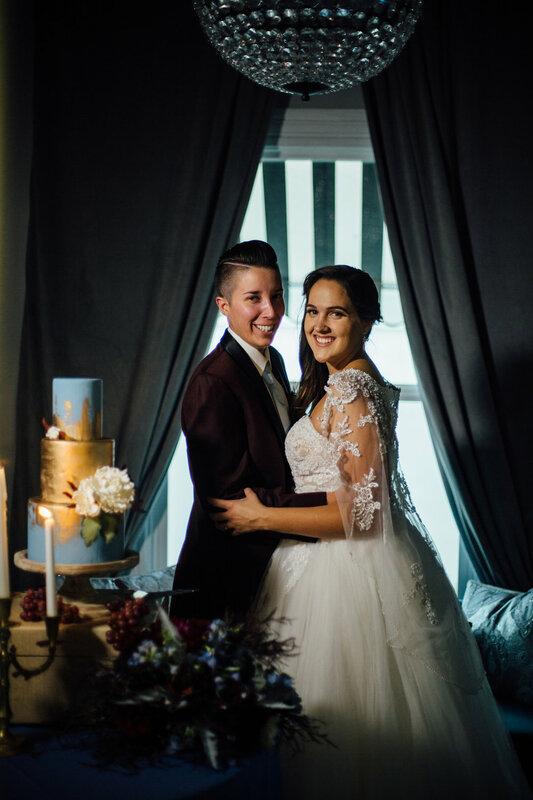 Love Wins Every Time - Especially with This Gorgeous Wedding Styled Shoot that Celebrates Our LGBTQ Friends. 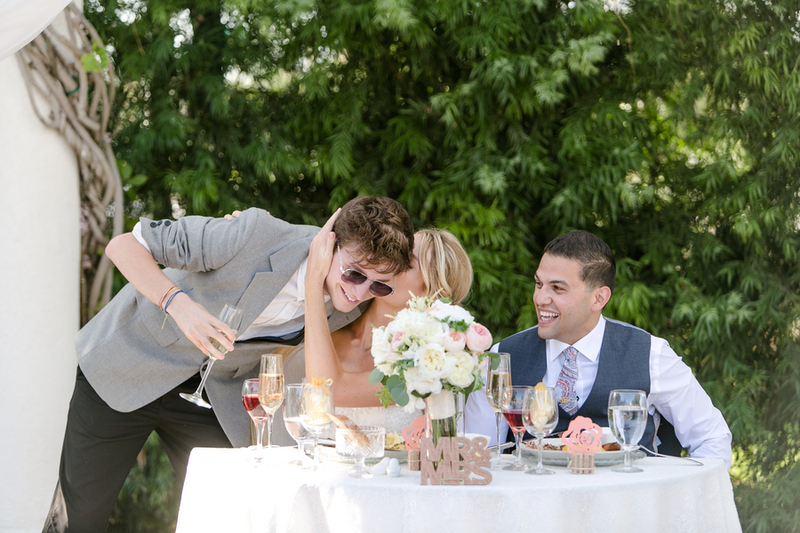 Love is Love. 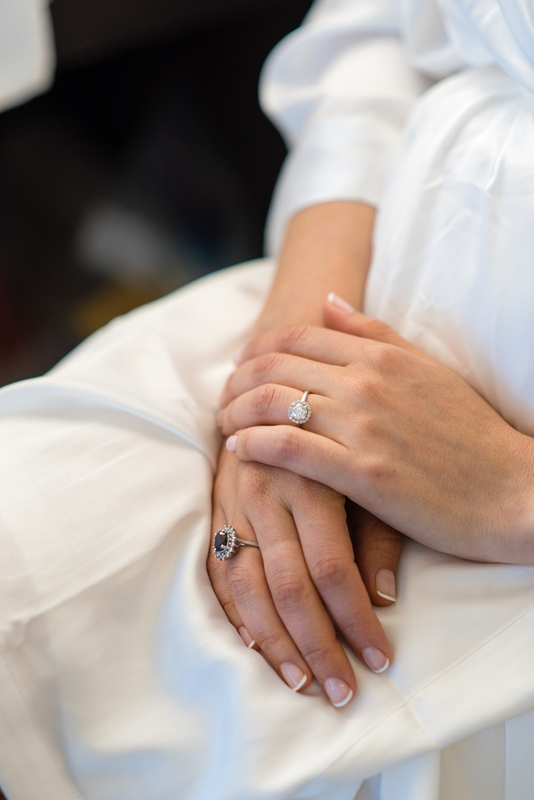 There’s nothing greater than the union of love, especially when we live in a world where LOVE WINS. 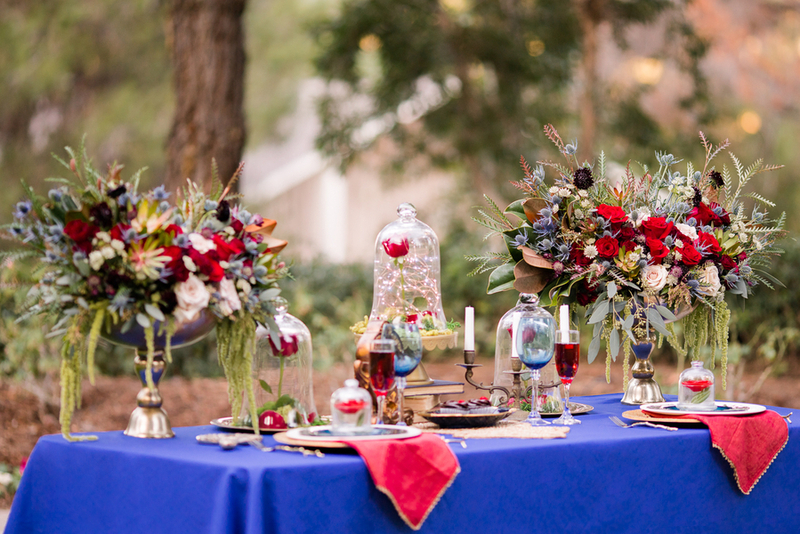 This styled shoot is set to emphasize the love that exists, the power of collaboration and the power of LOVE. 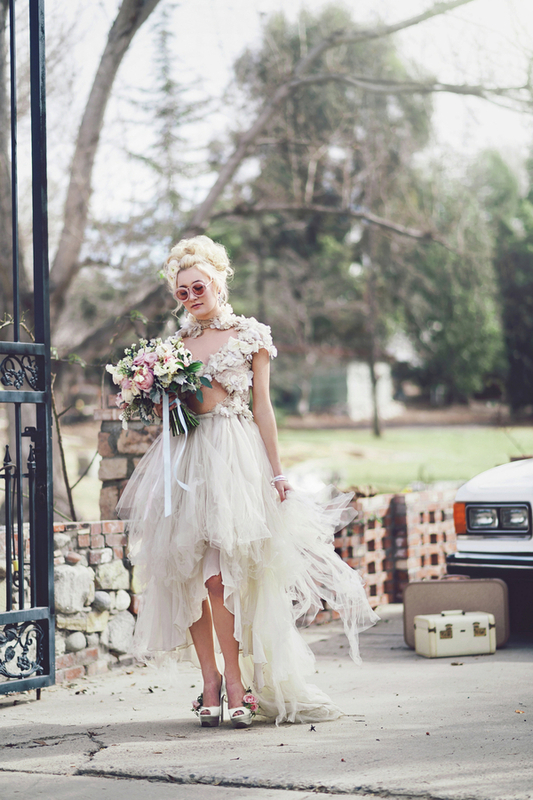 Shattering the glass ceiling was just one of the motives behind this new age shoot. 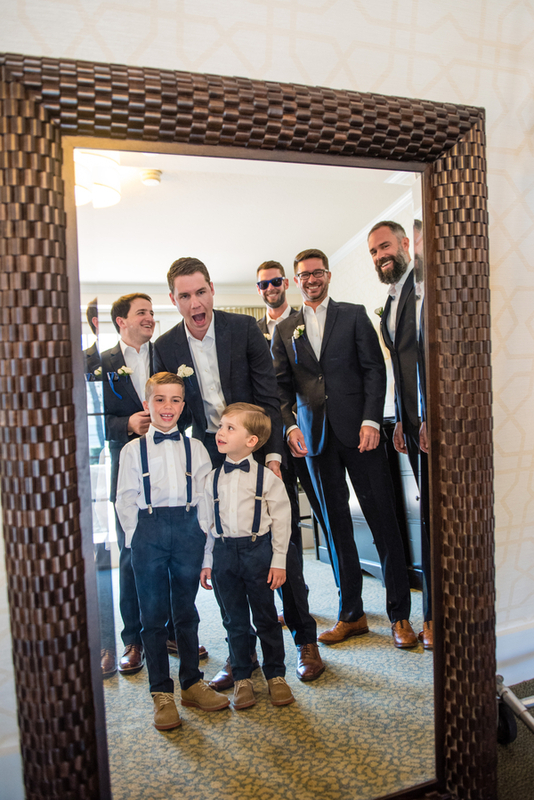 Love is Love. 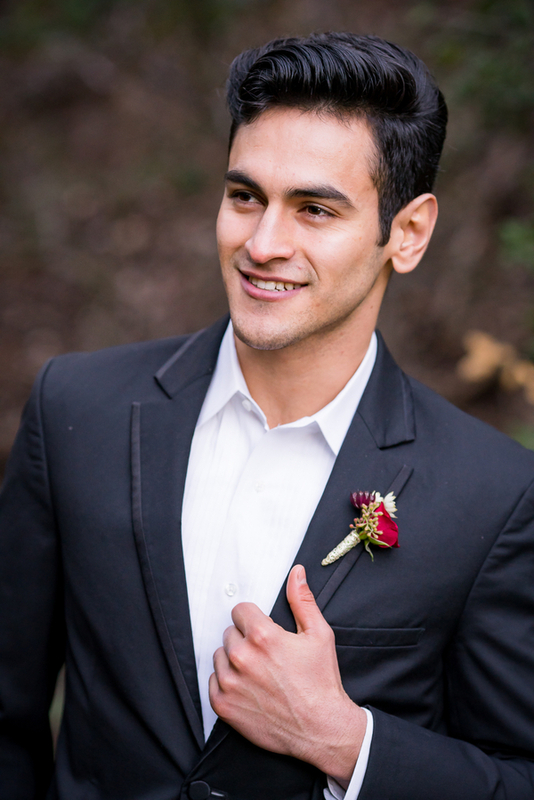 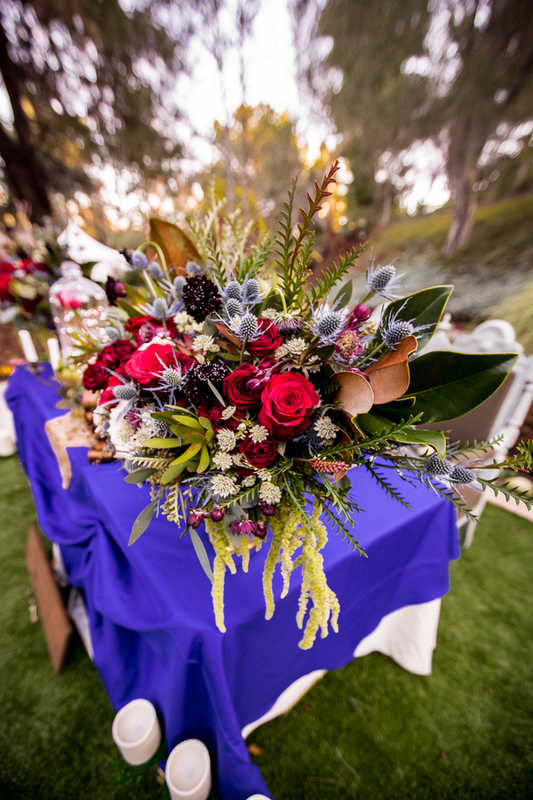 Styled by Fairy Godmother, a Wedding & Event Company, with deep blues, rich reds [check out her gorgeous burgundy tux jacket!] 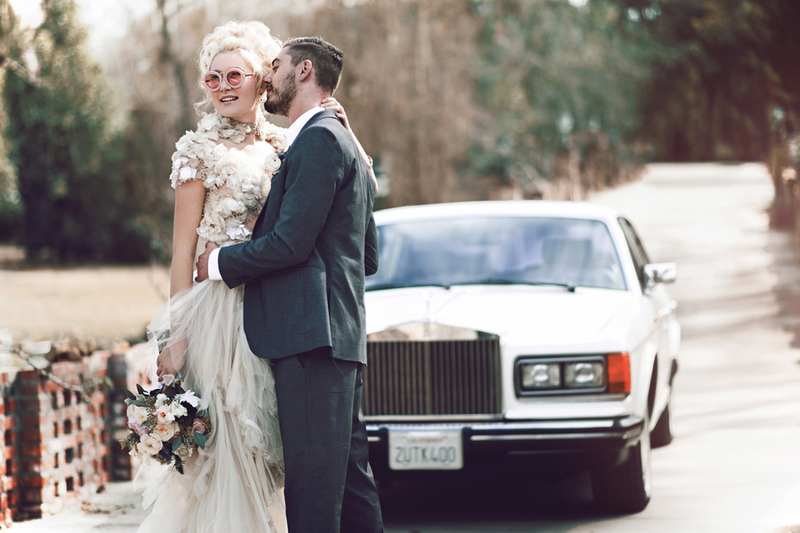 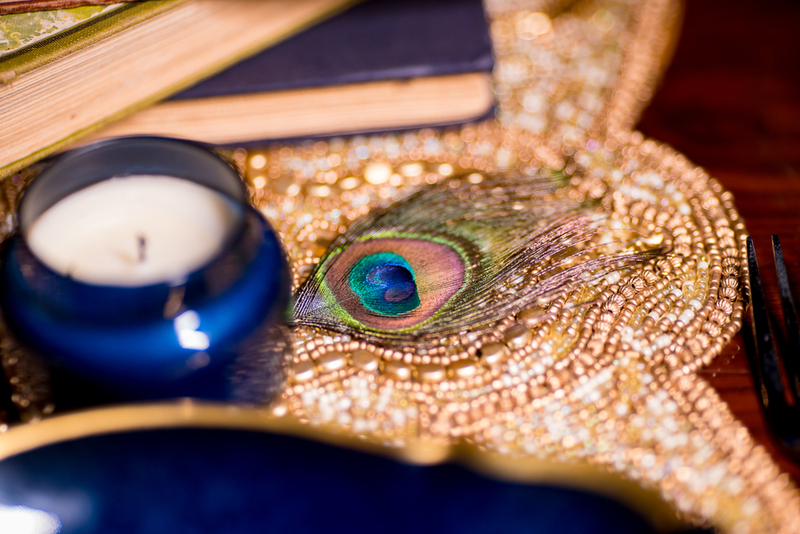 and metallic gold, this powerful, vintage inspired shoot wins too! 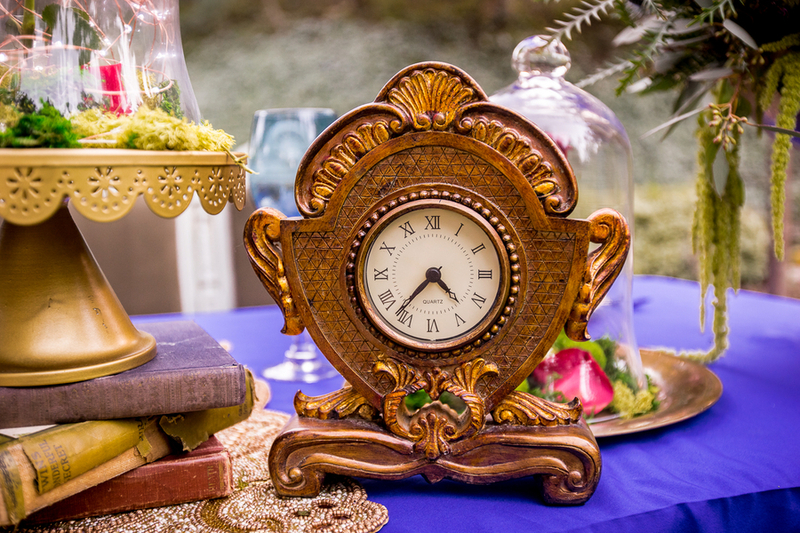 "ren-dez-vous": noun: a meeting at an agreed time and place, typically between two people. 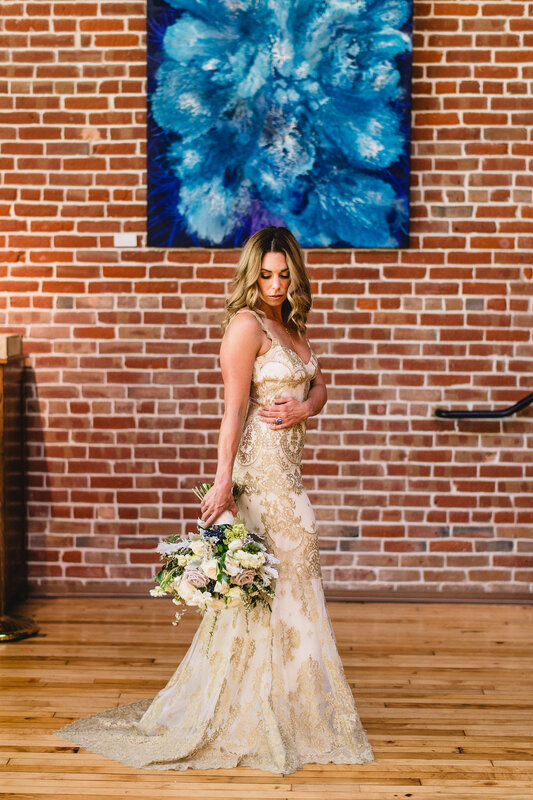 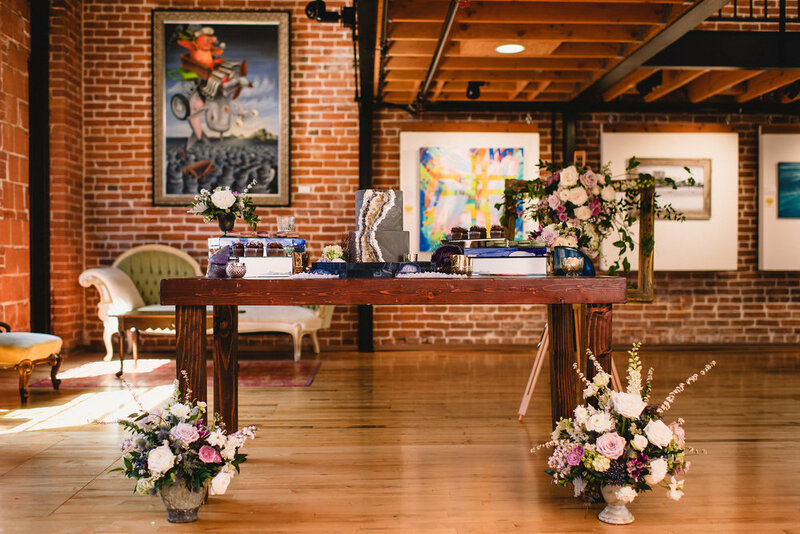 This pop up wedding styled shoot was set in the loft of an antique store in the heart of downtown Bakersfield, CA. 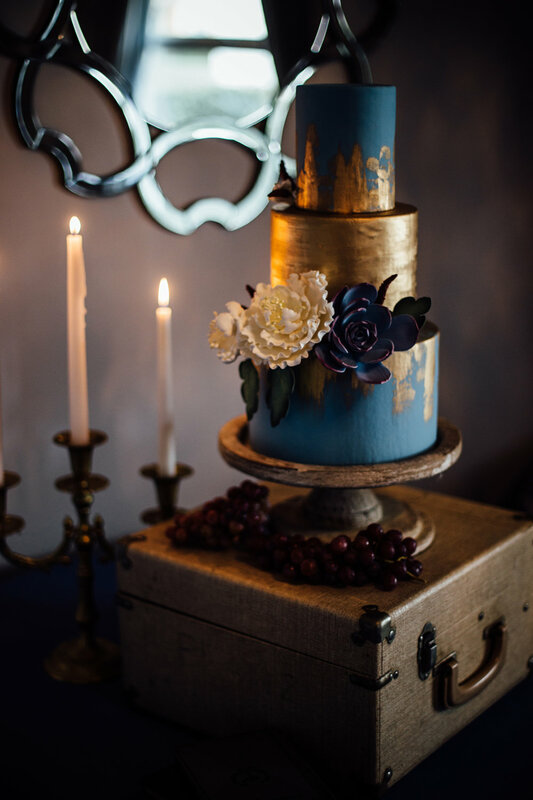 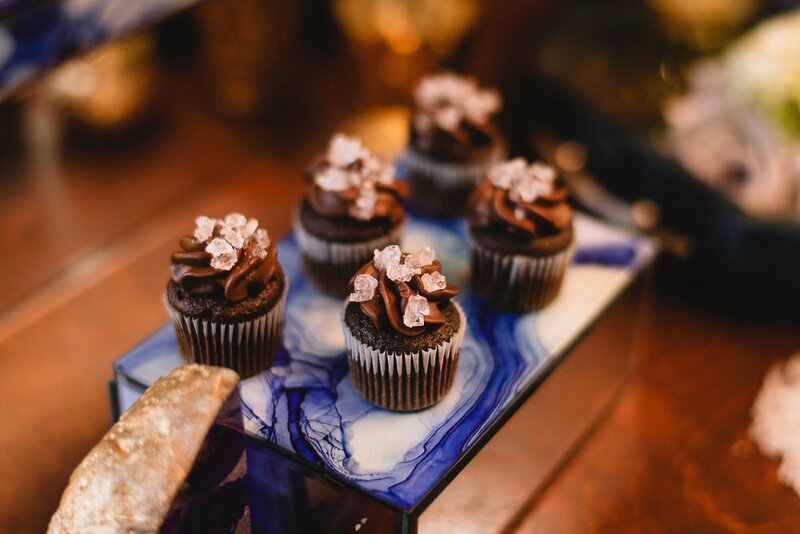 Vintage vibes illustrated with dark, deep maroons and touches of gold were juxtaposed by the natural light from the industrial windows and bright colored stones handcrafted into the décor. 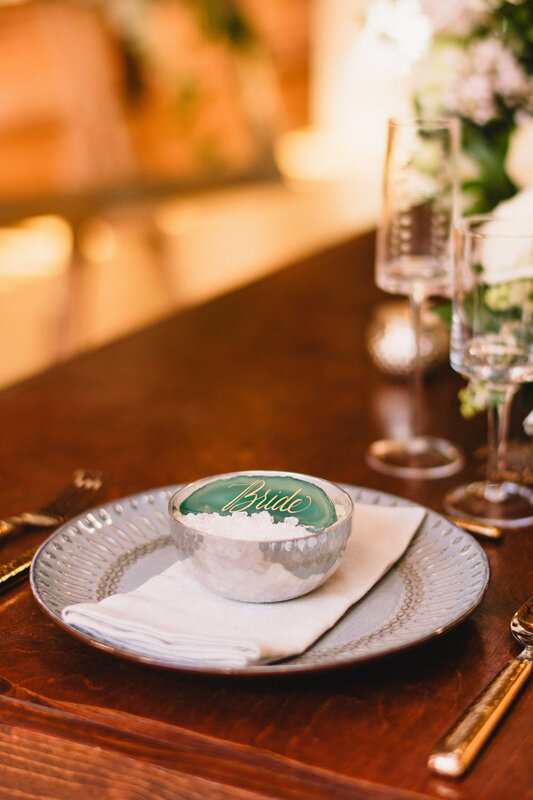 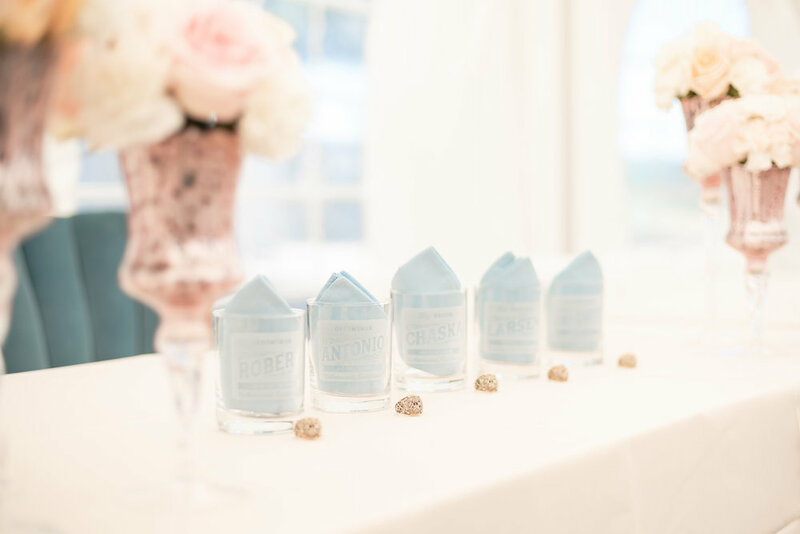 Mis-matched candlesticks, antique dishes and sugar crystal name cards completed the tablescape. 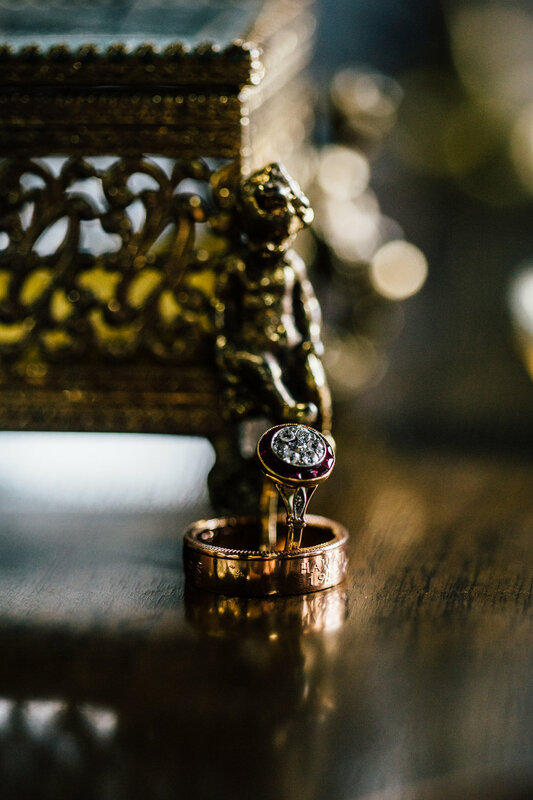 Handmade-coin rings symbolize the labor of lasting love and soft, airy touches remind us of true love’s kiss! 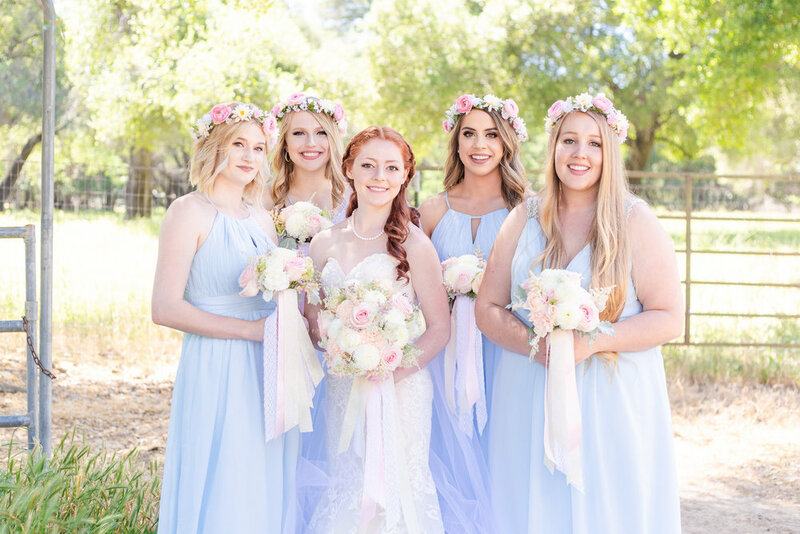 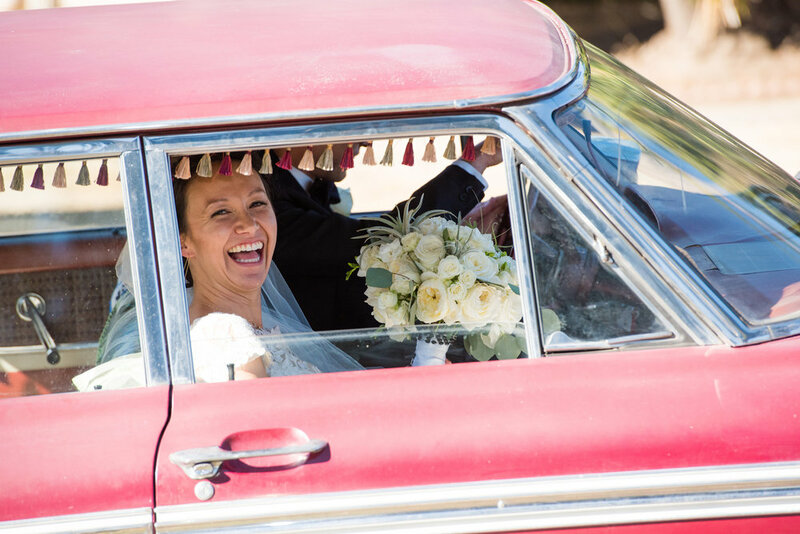 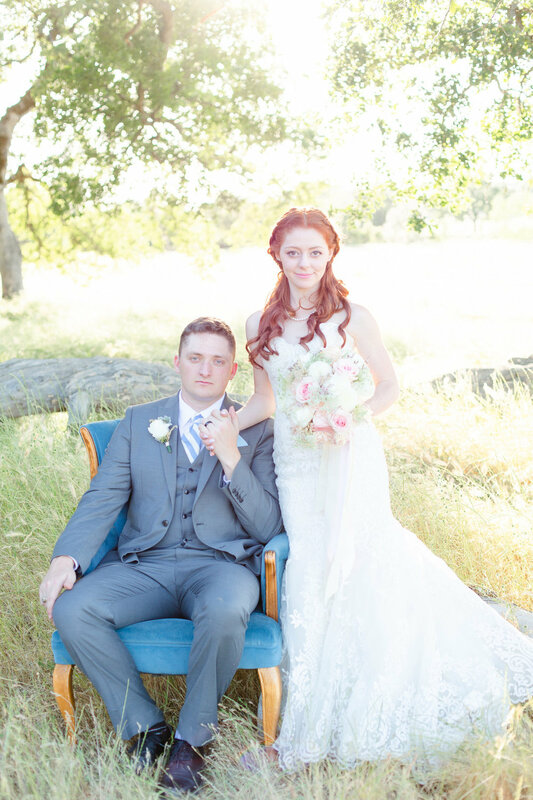 We love wedding themes and what with tomorrow being the Fourth of July we thought you'd love these beautiful pics from a classic Americana, red, white and blue wedding photographed by San Diego wedding photographers Bob Hoffman Photo & Video! 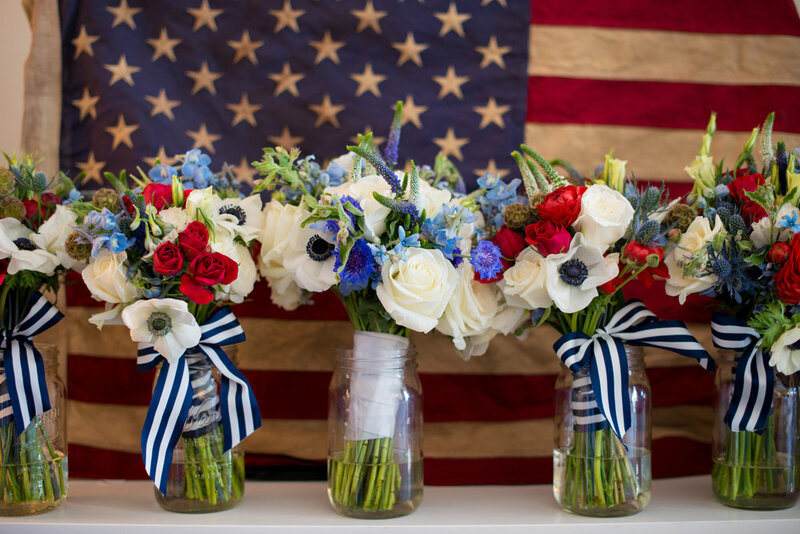 Happy 4th of July San Diego! 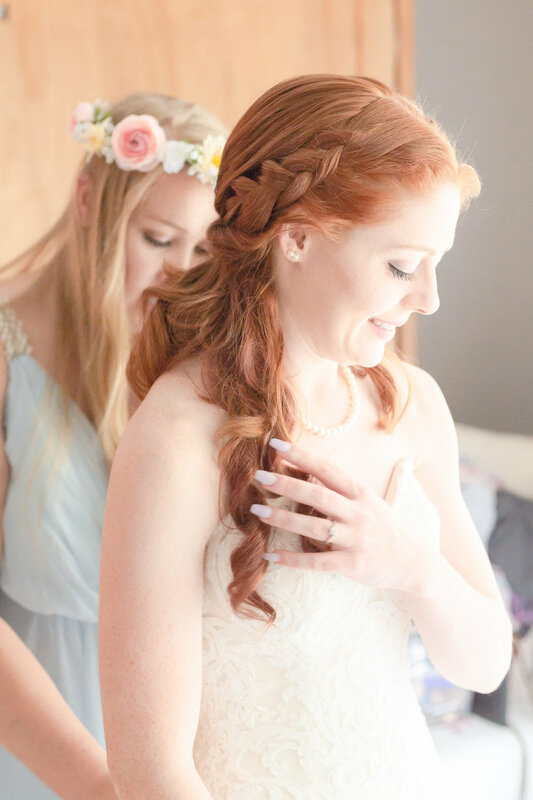 Megan and Chaska have always known they would be together. 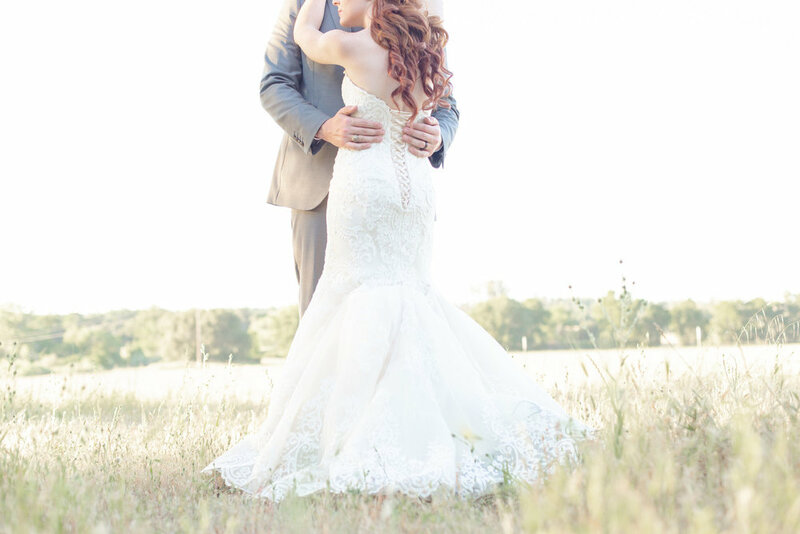 Their love story began several years ago while still in high school. 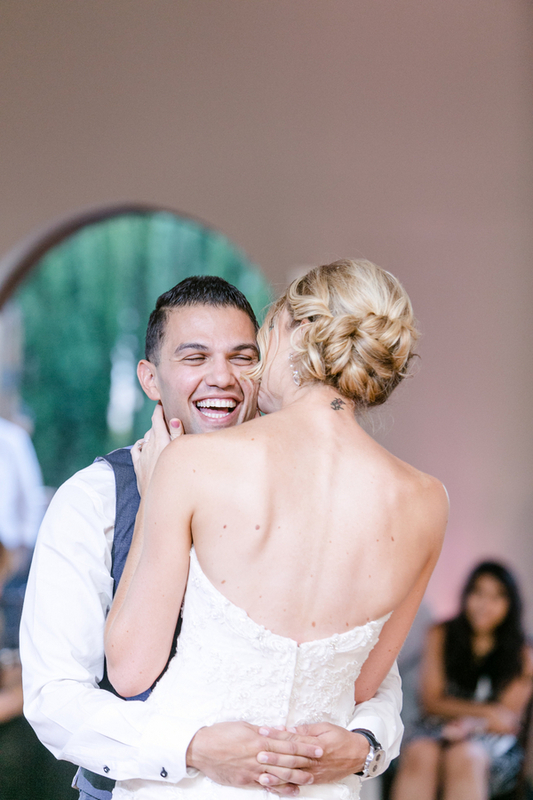 Chaska was the star football player and she was the adorable cheerleader. 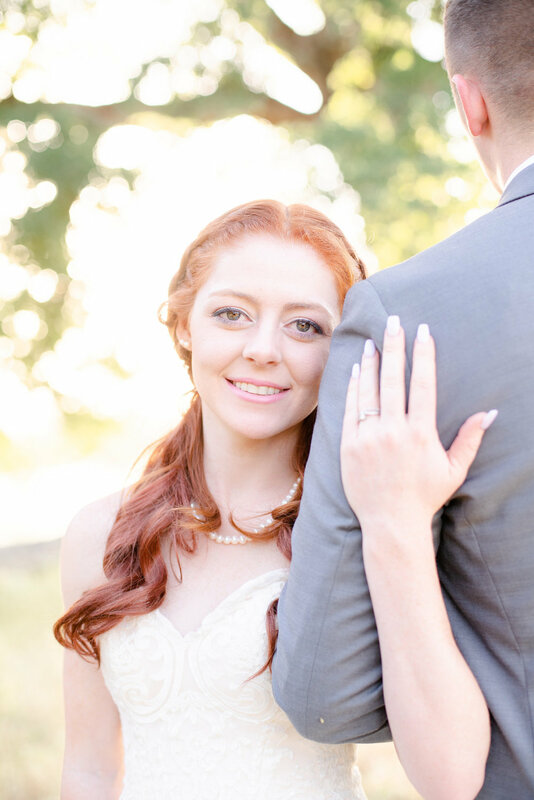 High school sweethearts, these two were married in the Spring on a beautiful day full of joy, love, and just plain good ol' fun. 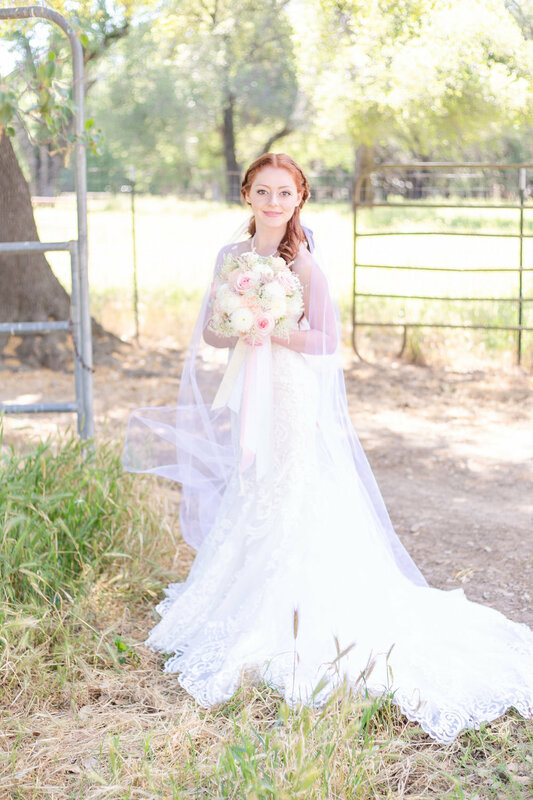 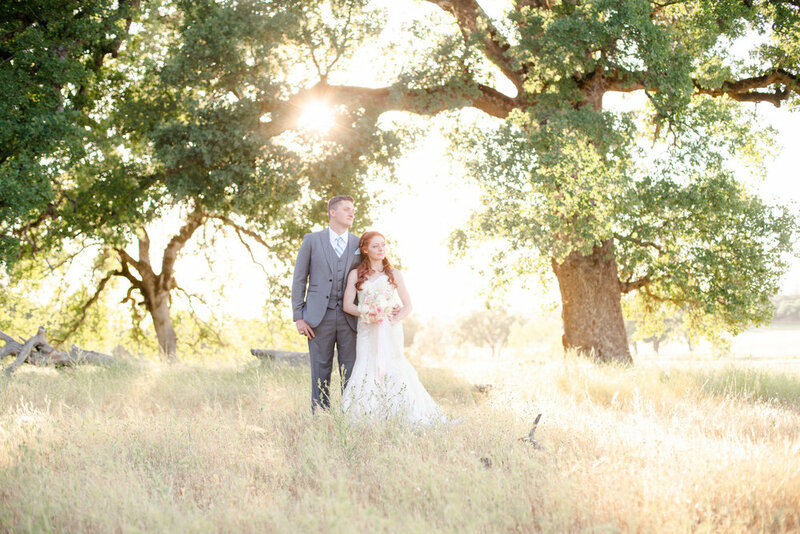 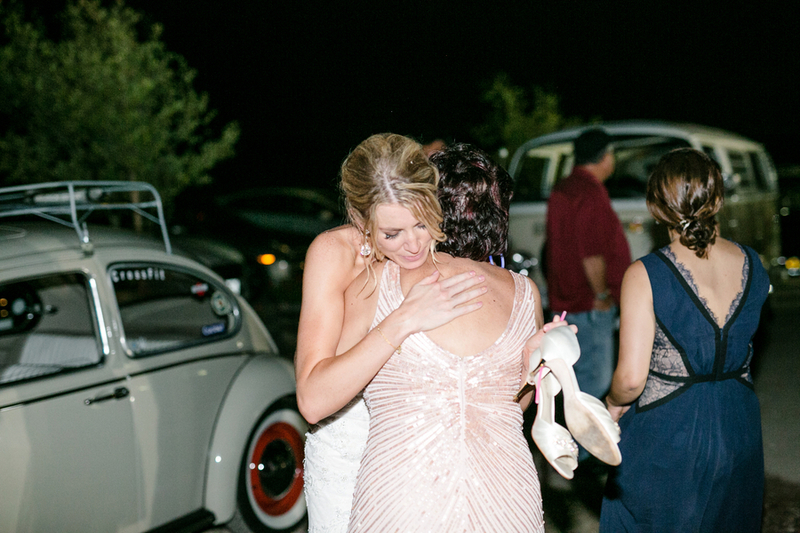 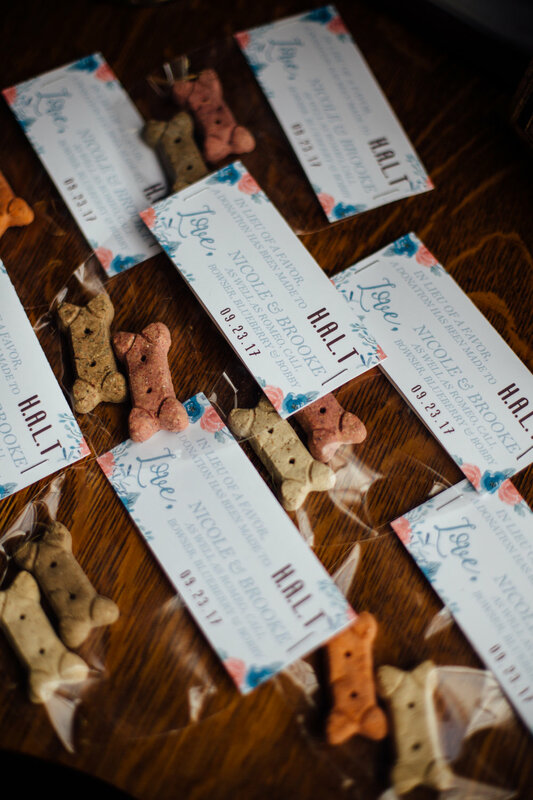 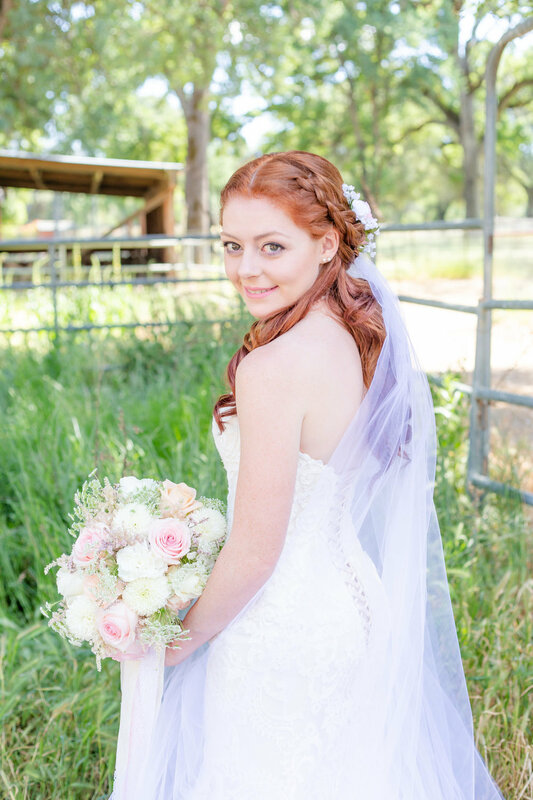 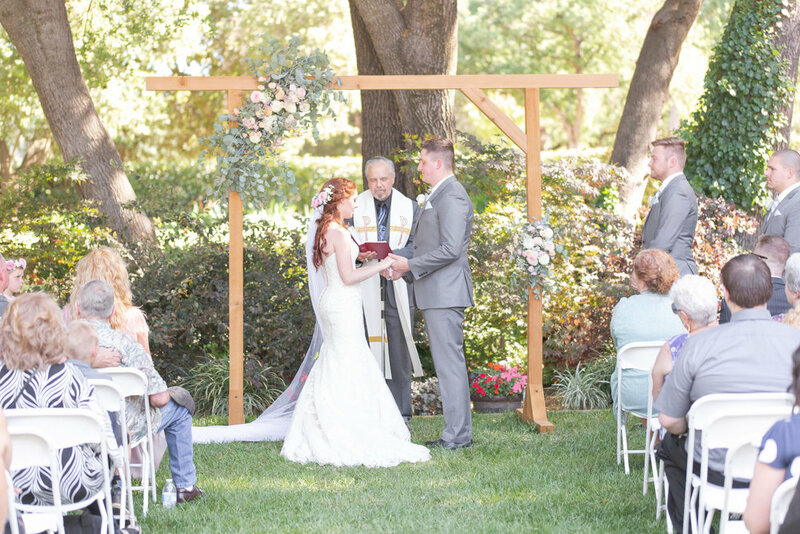 Set on the beautiful Heart S Ranch in Cottonwood, Ca., with the sun shining, and a light breeze, Megan, and Chaska entered into their bond in front of their closest friends and family. 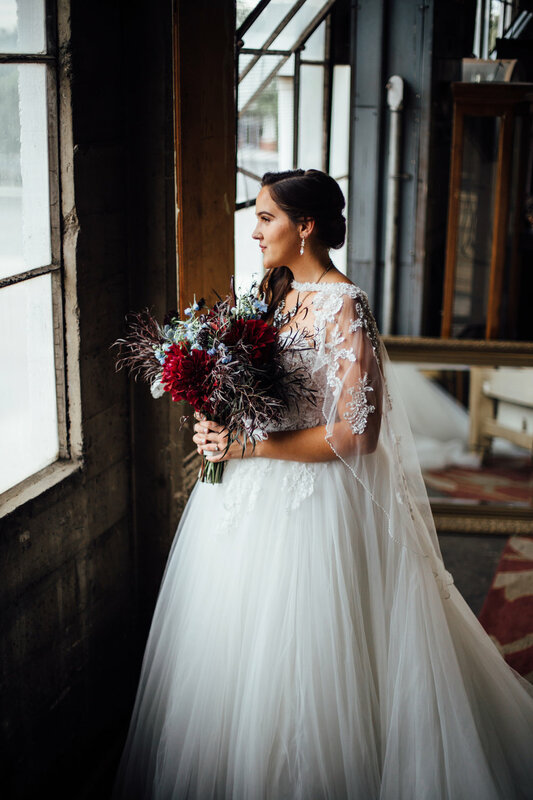 Having just graduated from the Citadel right before their wedding day, Chaska will be reporting to active military service very soon. 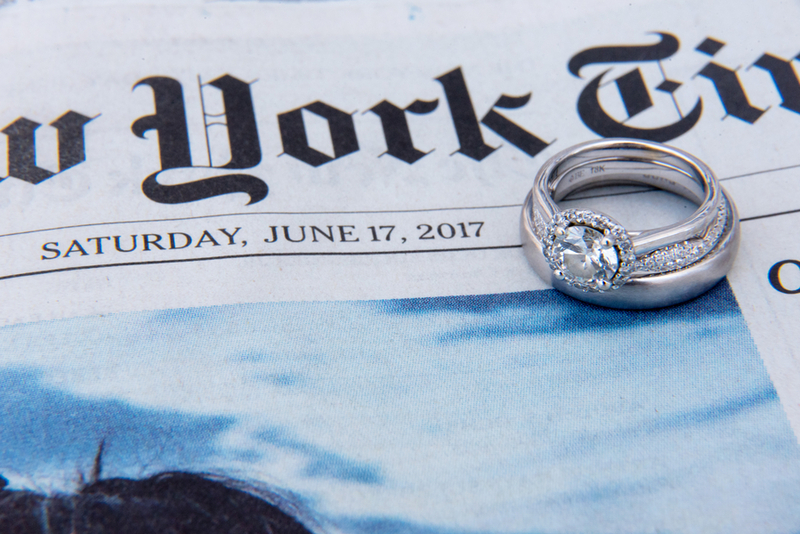 Their new adventure is just beginning! 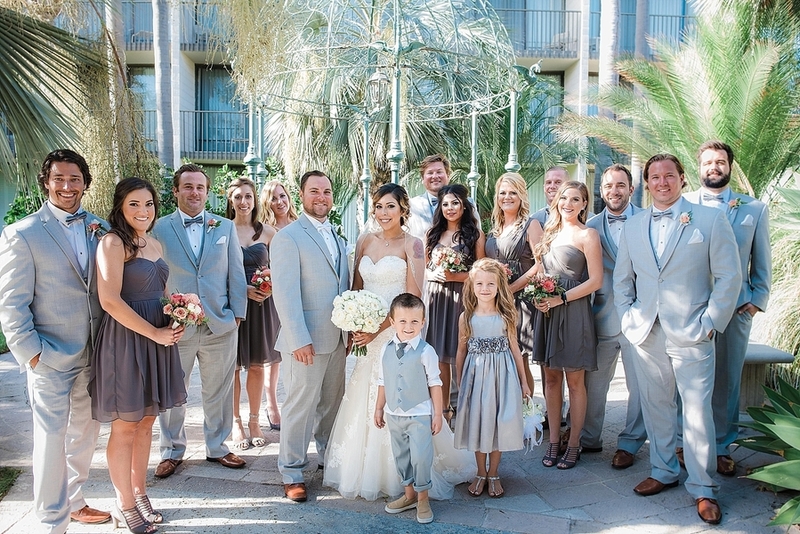 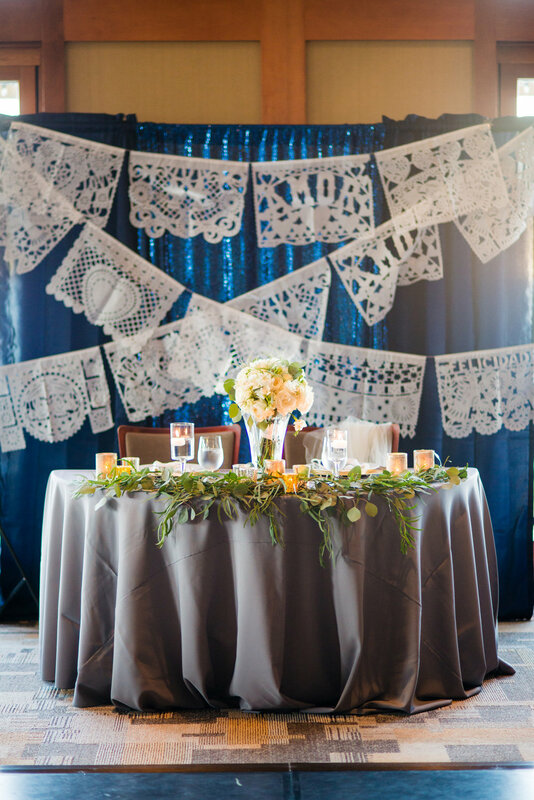 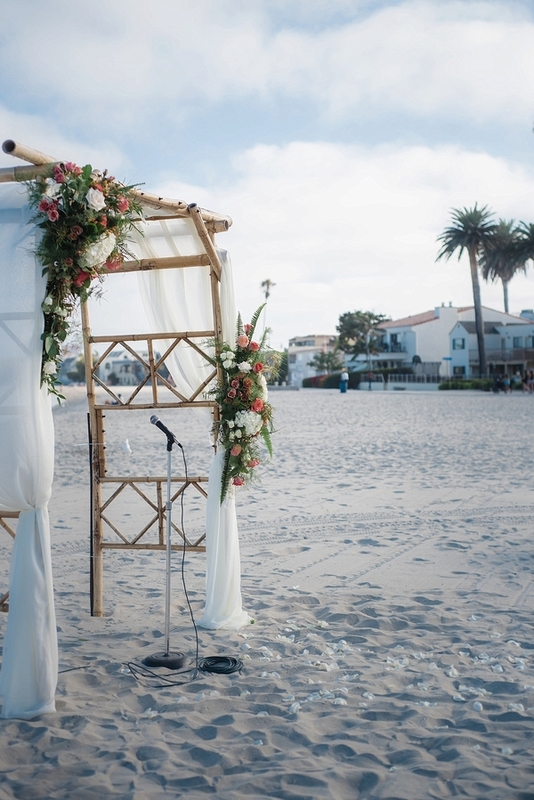 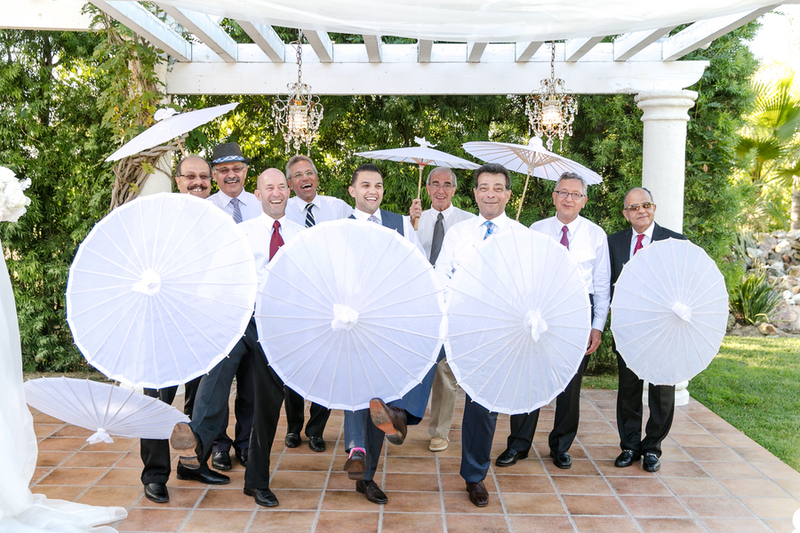 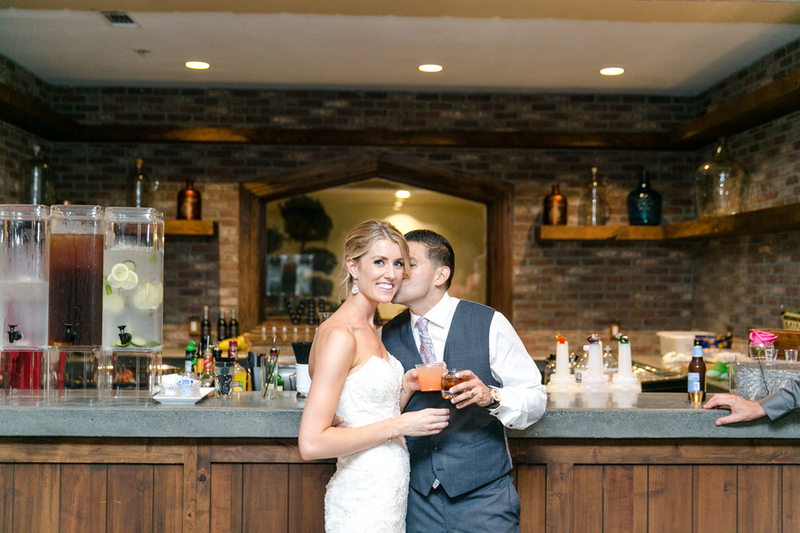 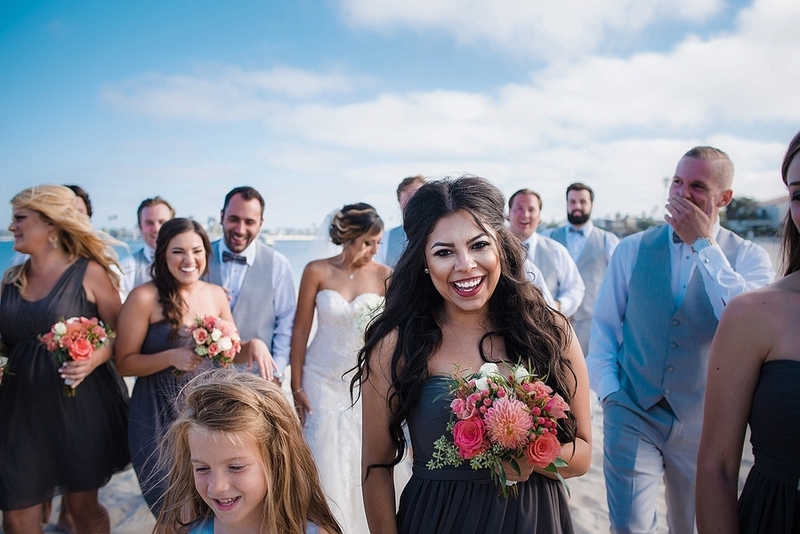 Coronado Wedding Celebrates the Marriage of Indonesian and Mexican Cultures with Flair! 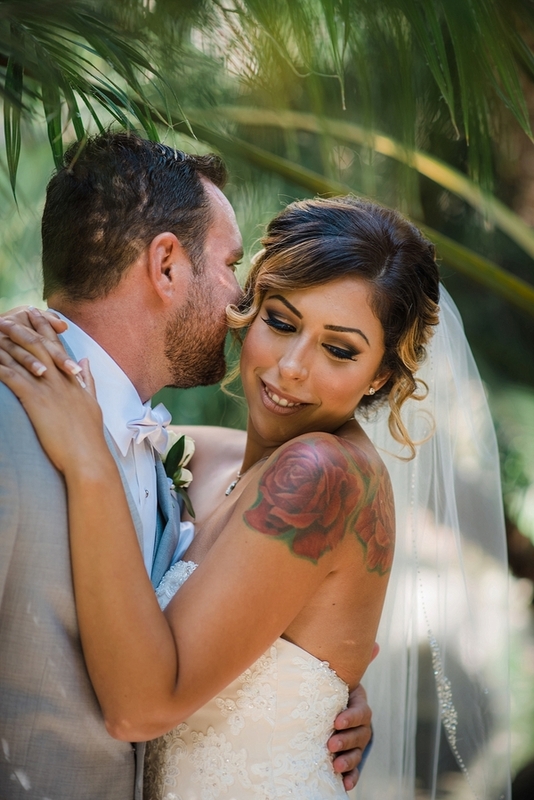 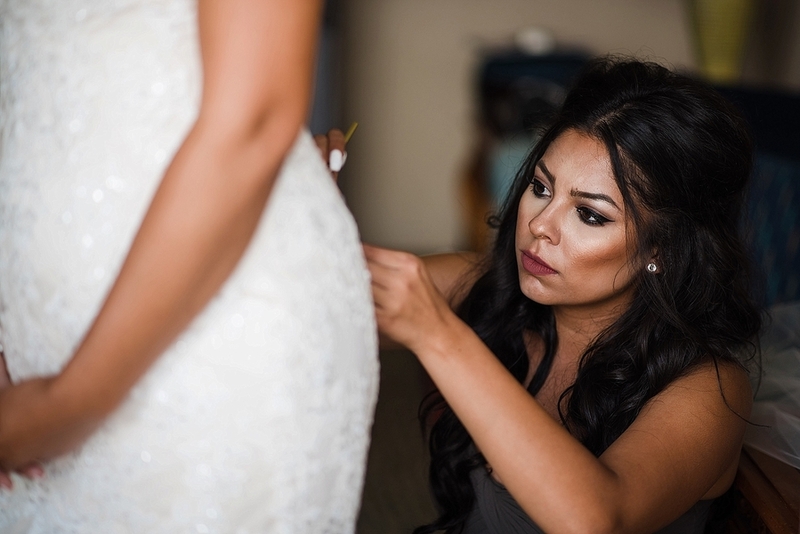 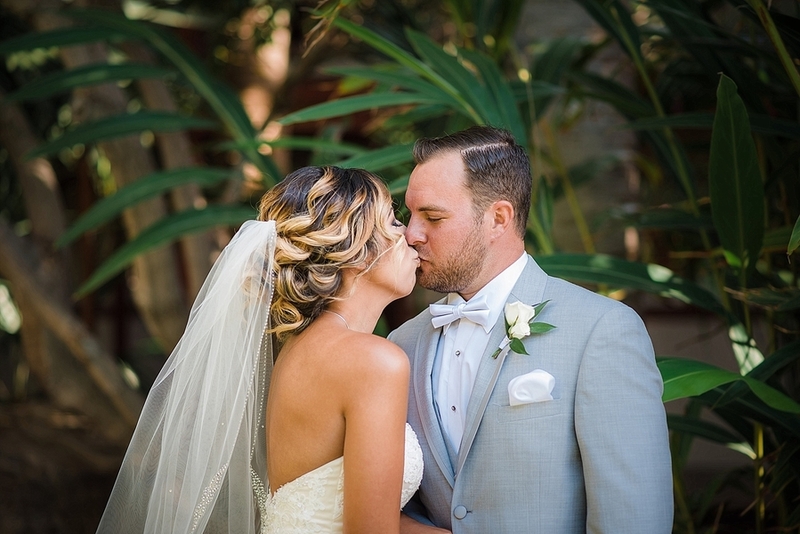 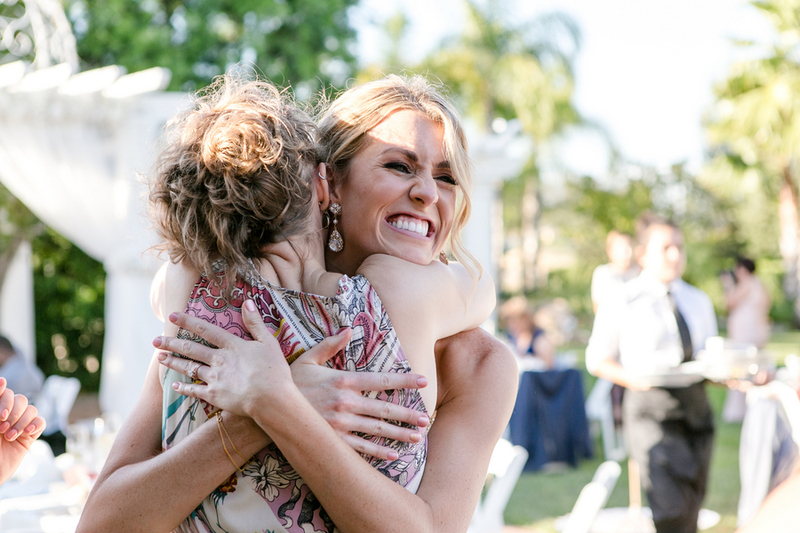 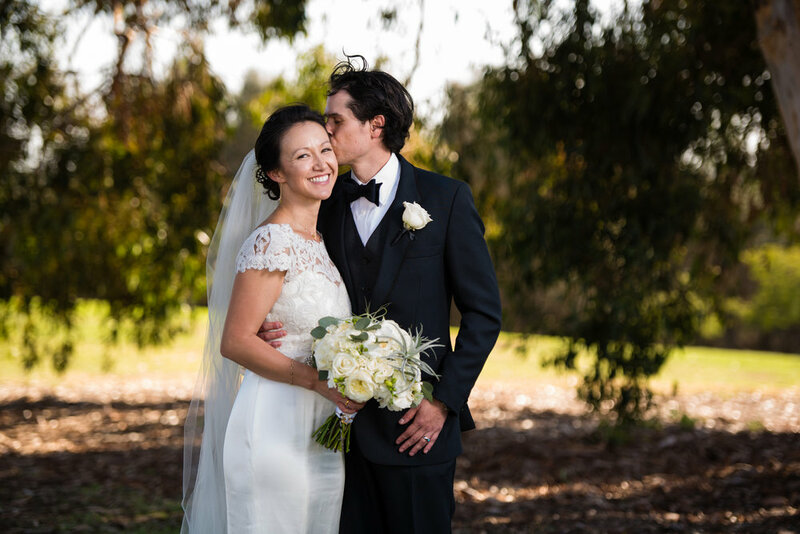 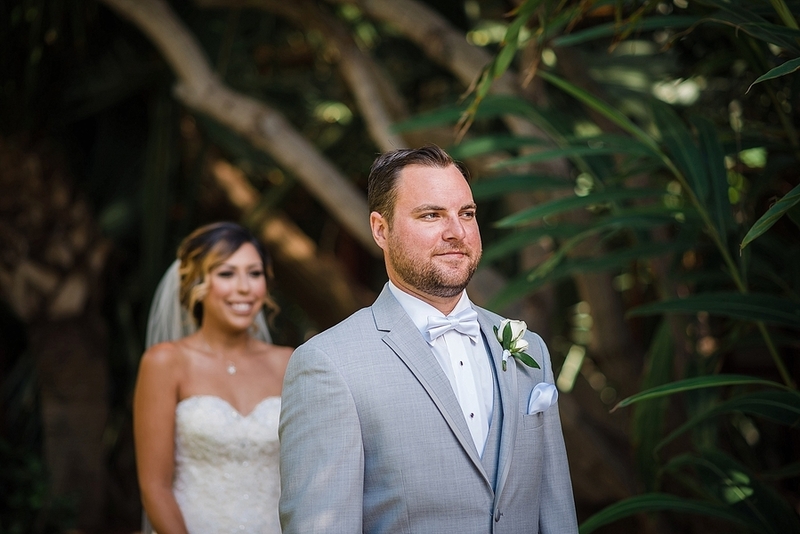 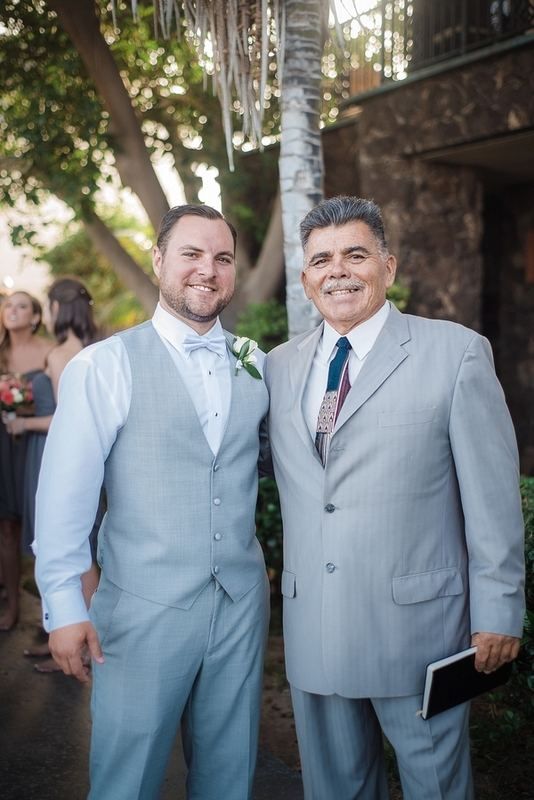 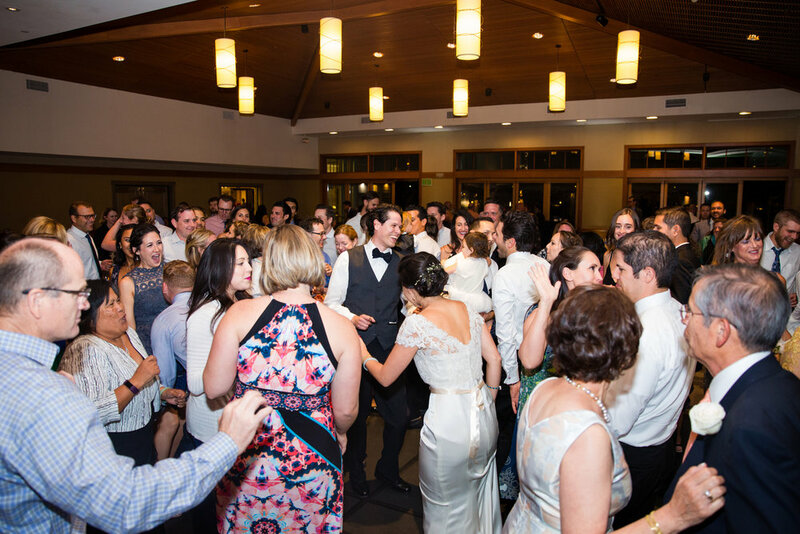 This San Diego wedding day was classic and romantic, with a Catholic Church wedding ceremony followed by a family and friend filled reception at he Coronado Community Center. 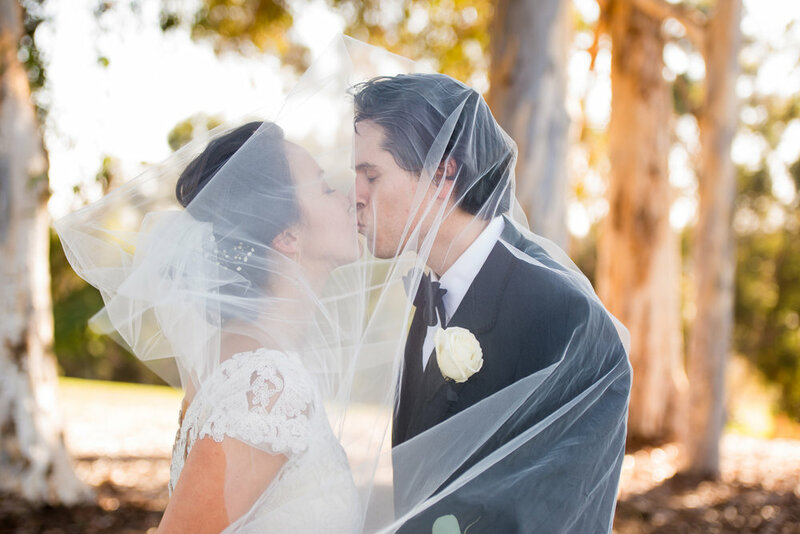 A celebration of two cultures, the bride is Indonesian and the groom's family hails from Mexico. 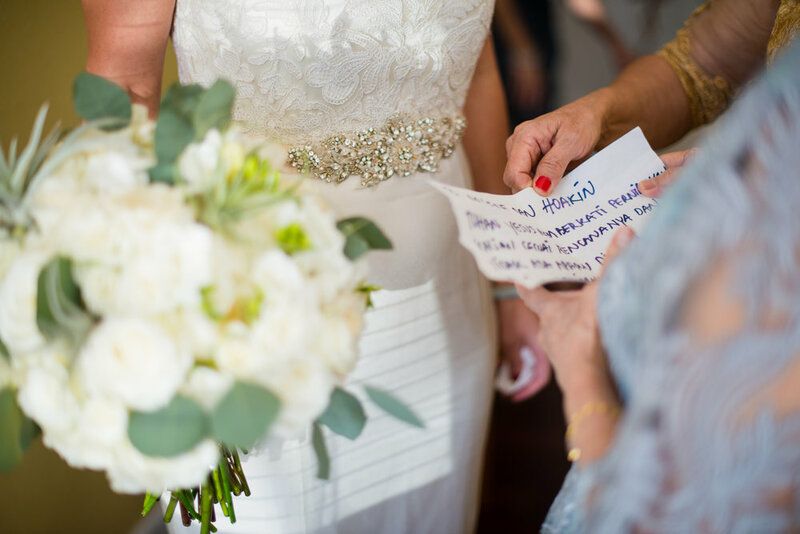 The wedding colors were a confetti like mix of grey, white, green, gold, rose gold and the bride's beautiful dress was handmade in Jakarta, Indonesia by a family friend. 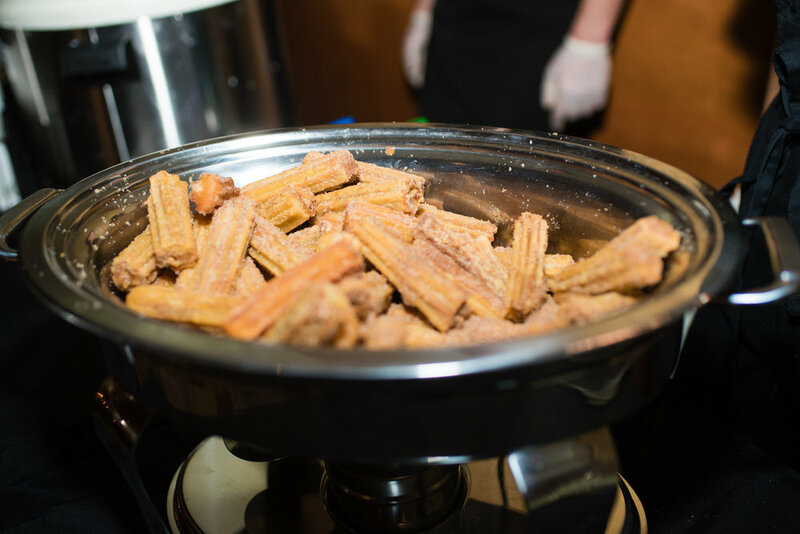 The food was catered by Mexico City Cuisine, to honor the groom's Mexican heritage, and oooooh there was a churro station for dessert! 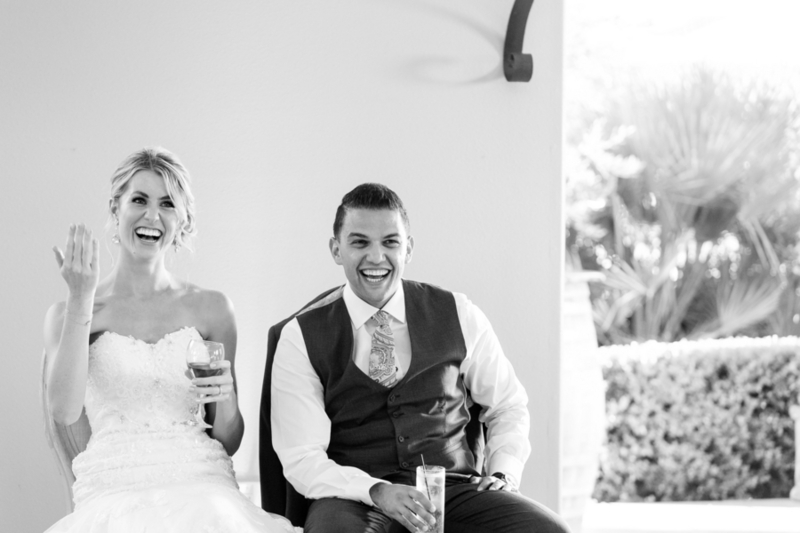 This gorgeous couple was nothing but smiles throughout the day and we can't help but smile along. 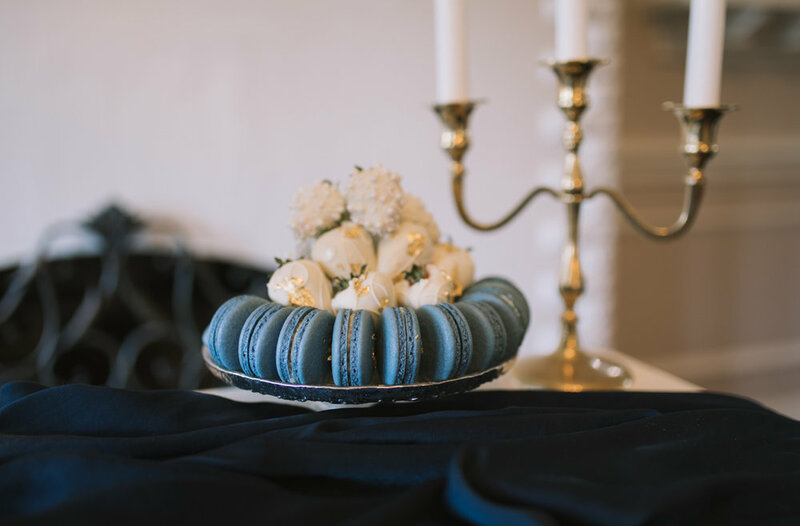 If you're in love, engaged, and planning your wedding then we know you won't even be thinking about having a 'Blue Christmas' a la Elvis! 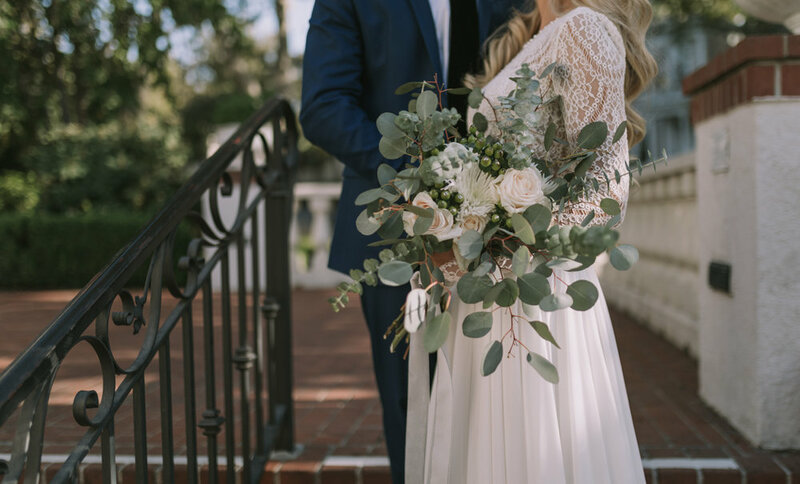 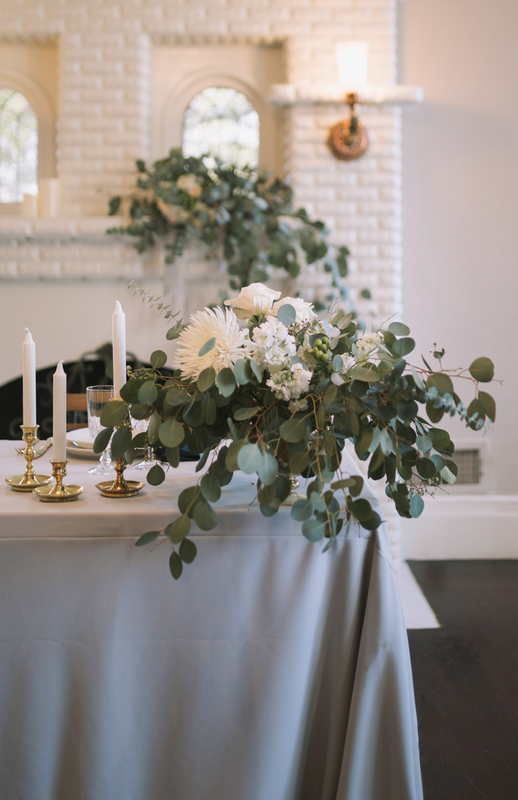 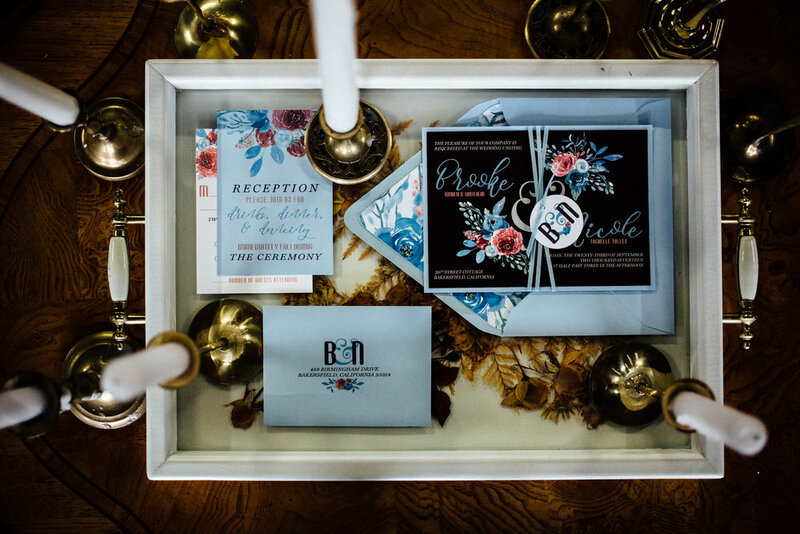 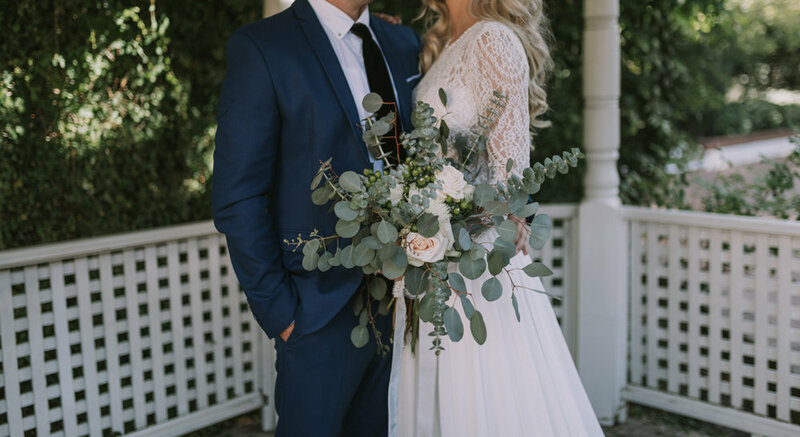 But if you love blue in weddings as much as we do we think you'll love this elegant and classic wedding styled shoot by our friends in Sacramento! 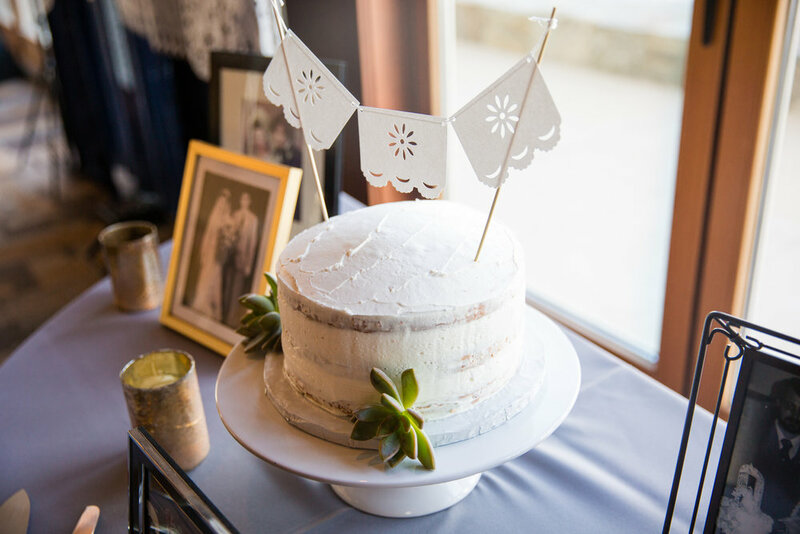 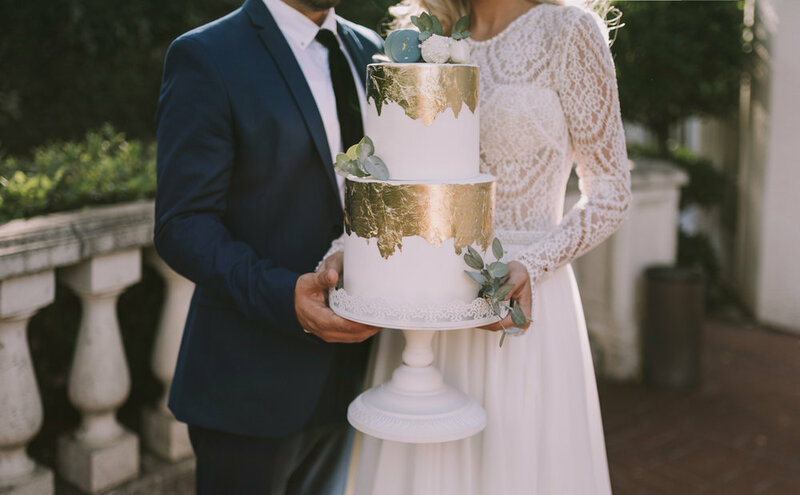 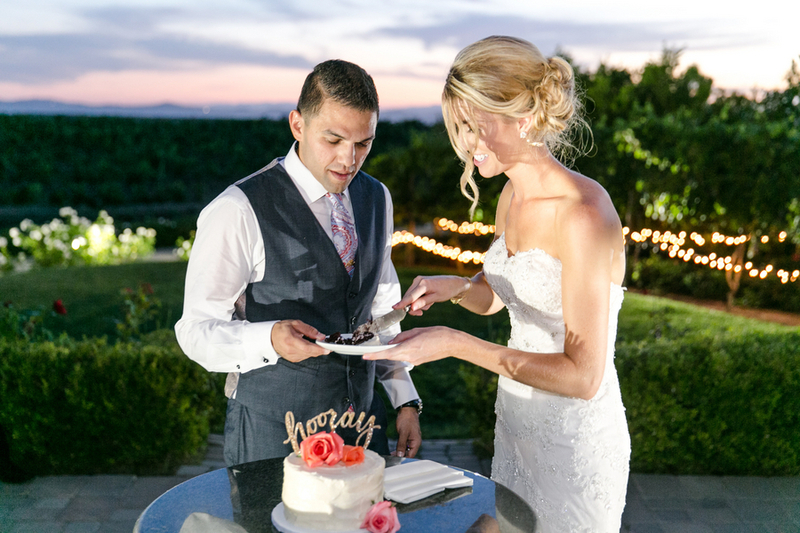 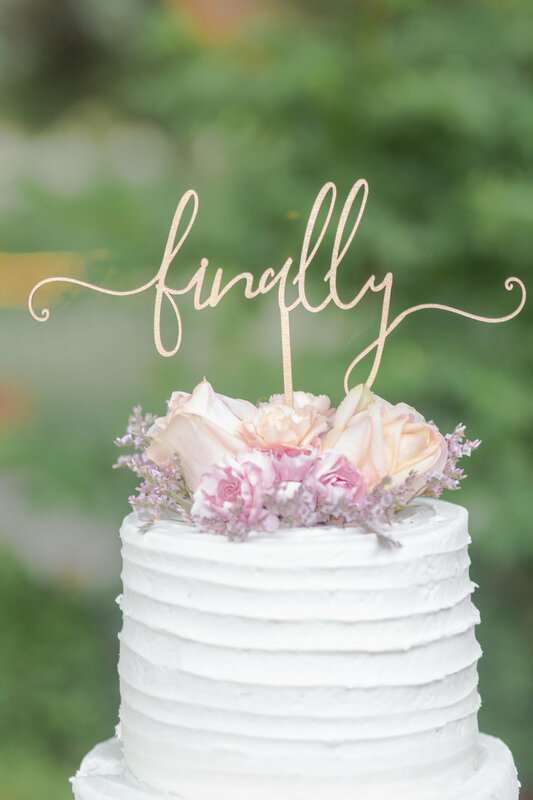 You know California [especially central and northern areas near Sacramento] were originally brought to life by the gold rush, so we just love the sparkle of the gold foil on this gorgeous wedding cake! 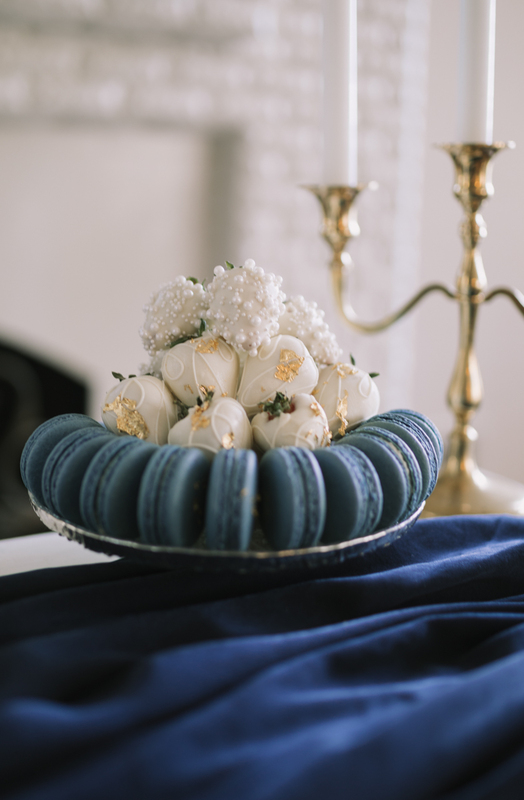 The trees and gazebo outside are a romantic's dream and the stark white on white indoor space is beautifully staged white white pieces and just enough blue [blue macarons!] 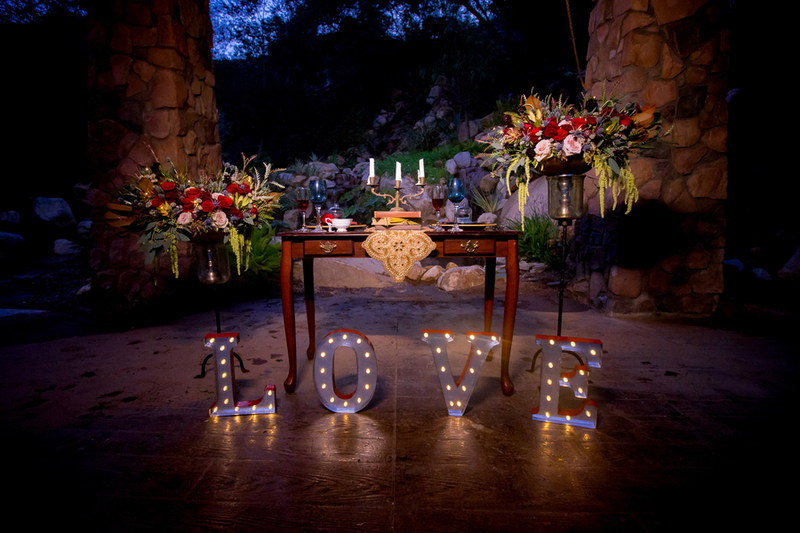 to perfectly punctuate and accent the tableau. 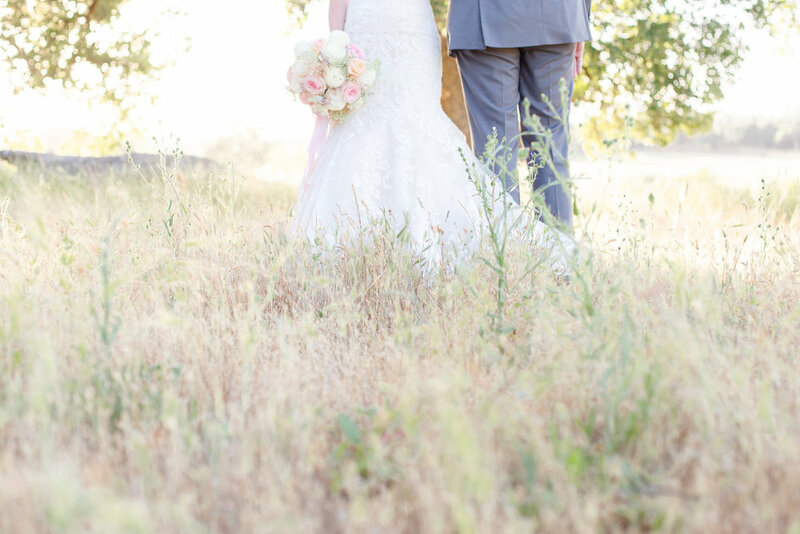 We got you Sacramento, we Californians have to stick together! 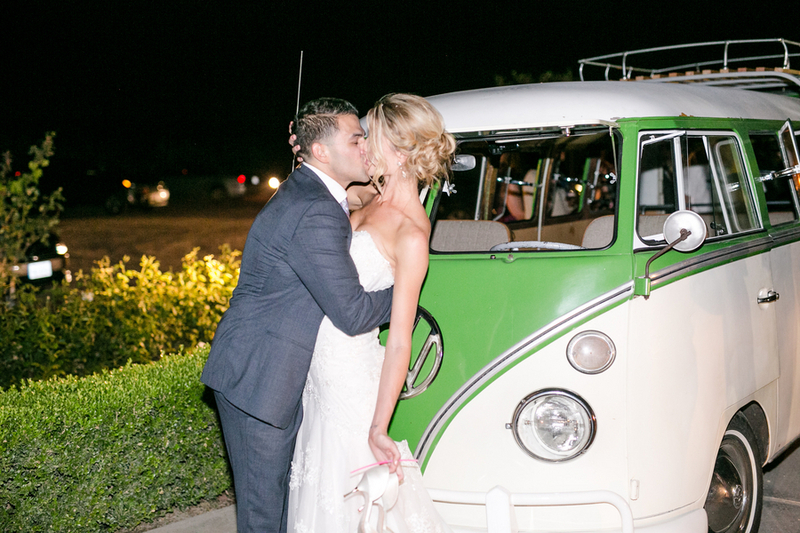 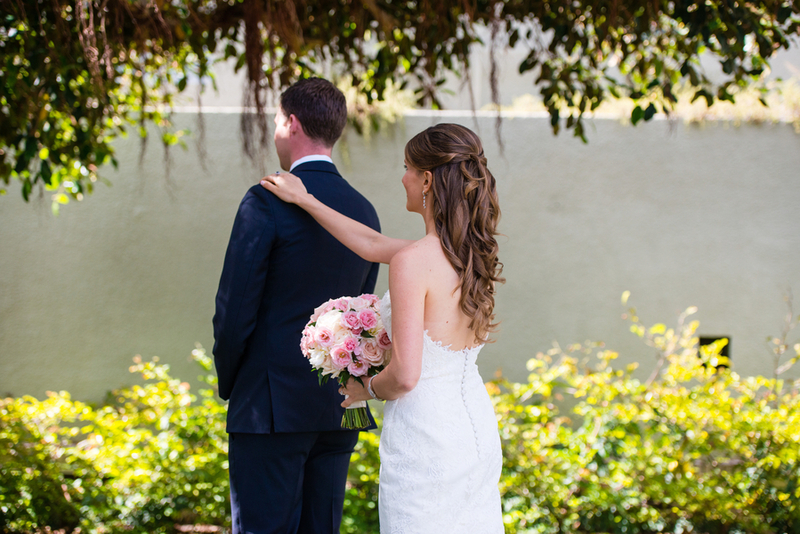 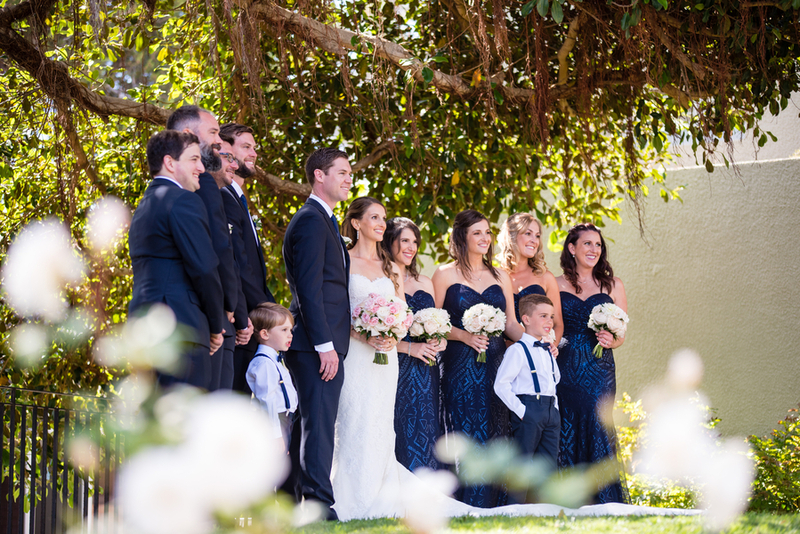 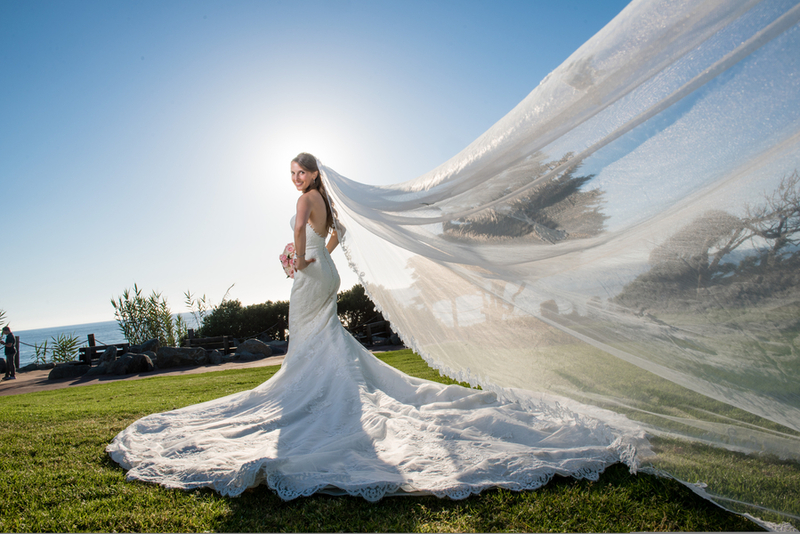 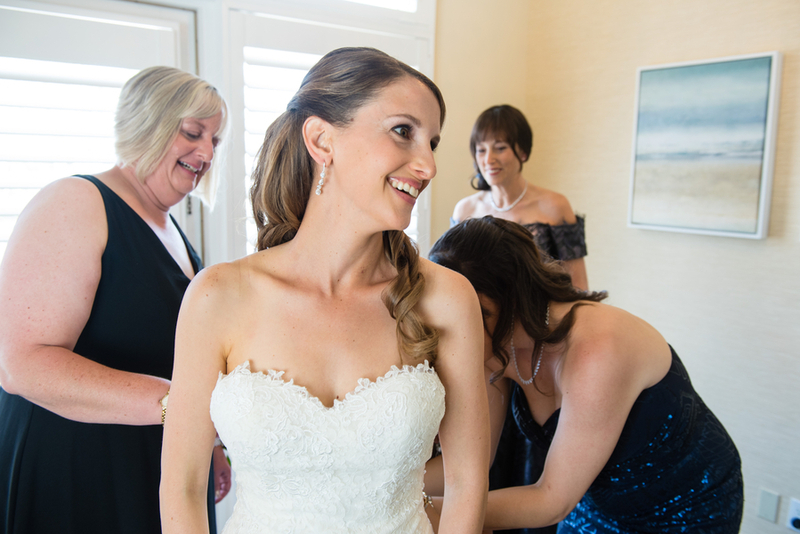 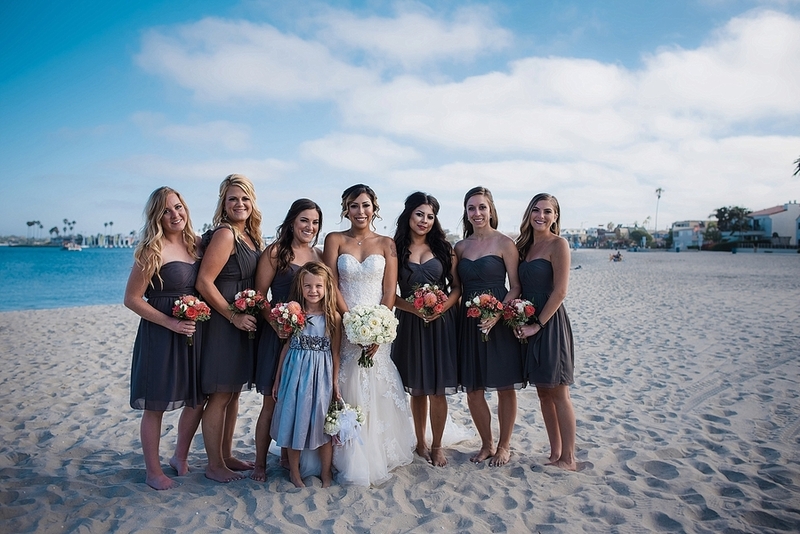 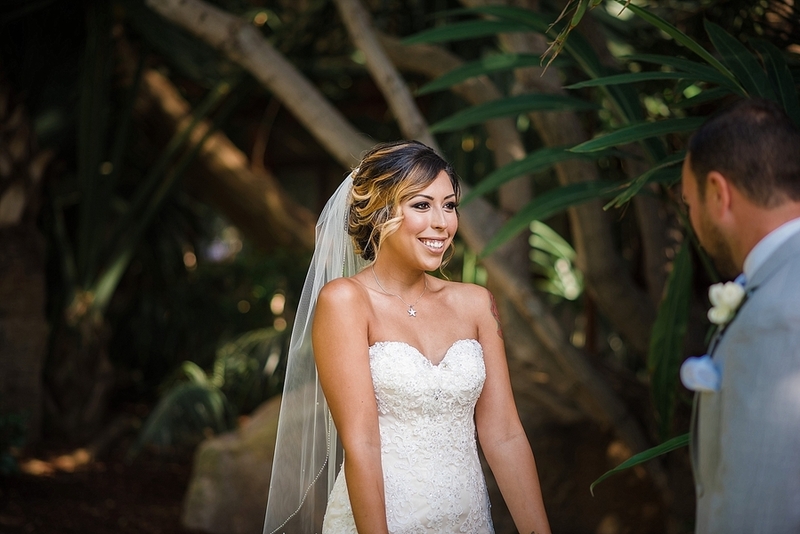 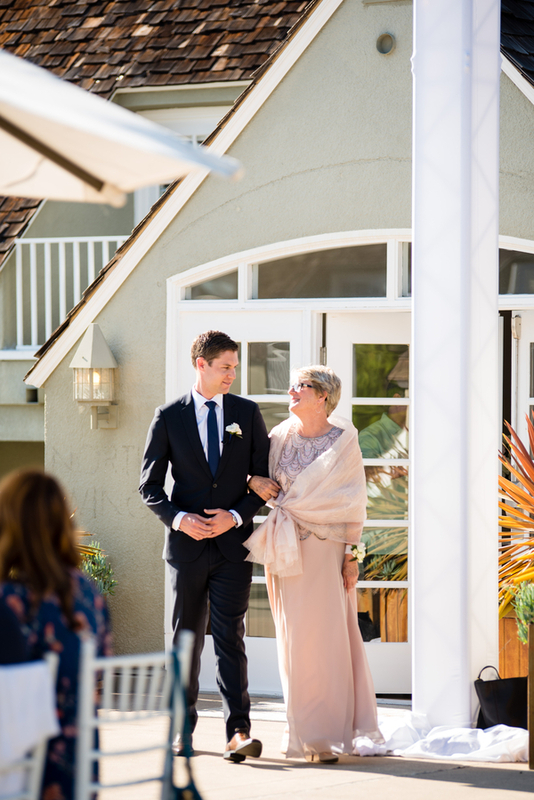 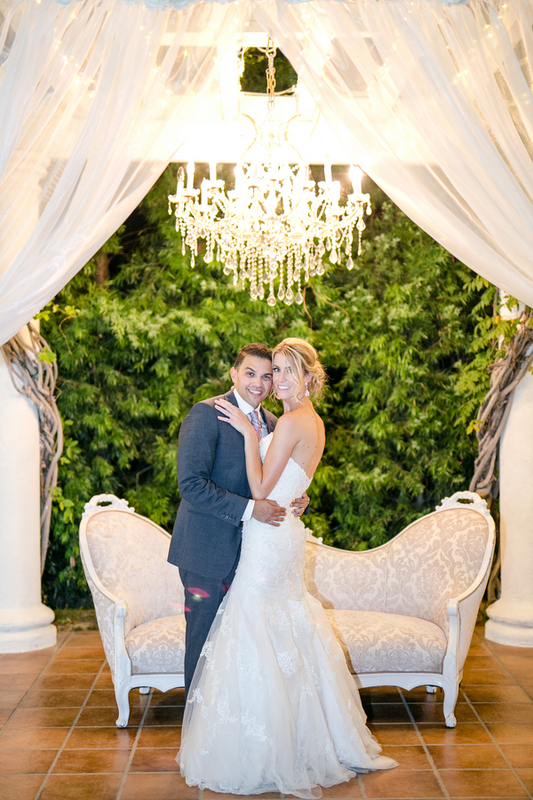 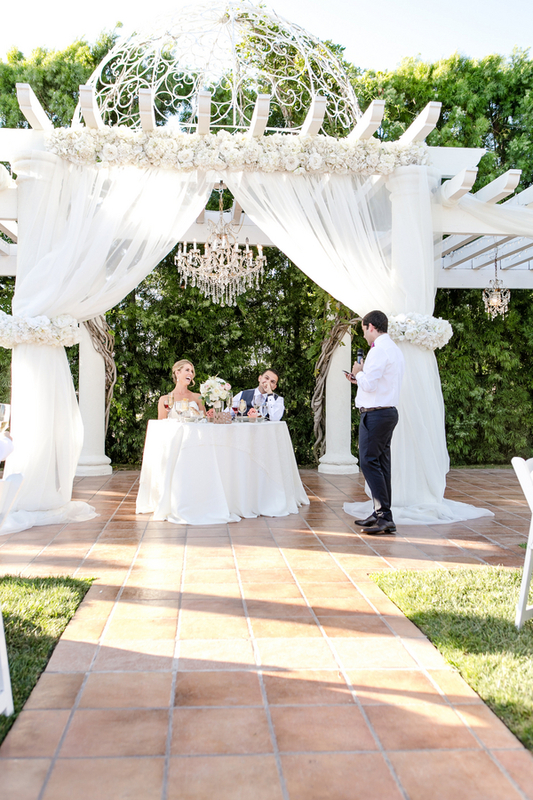 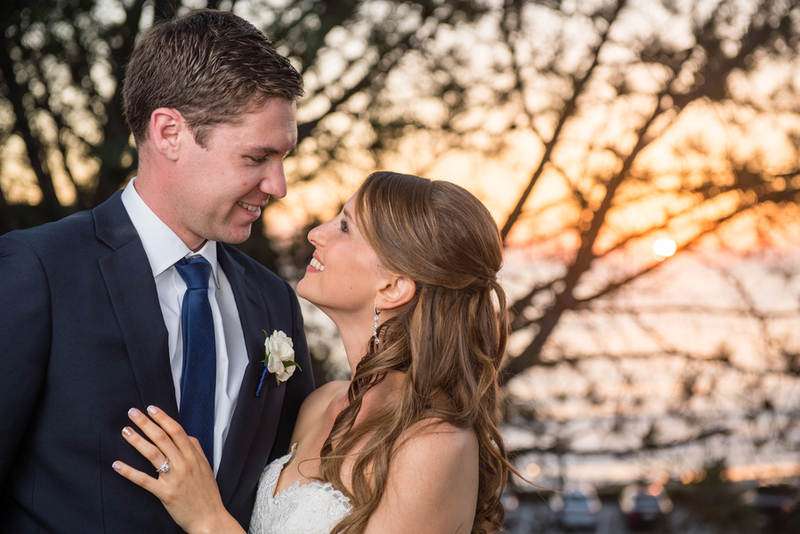 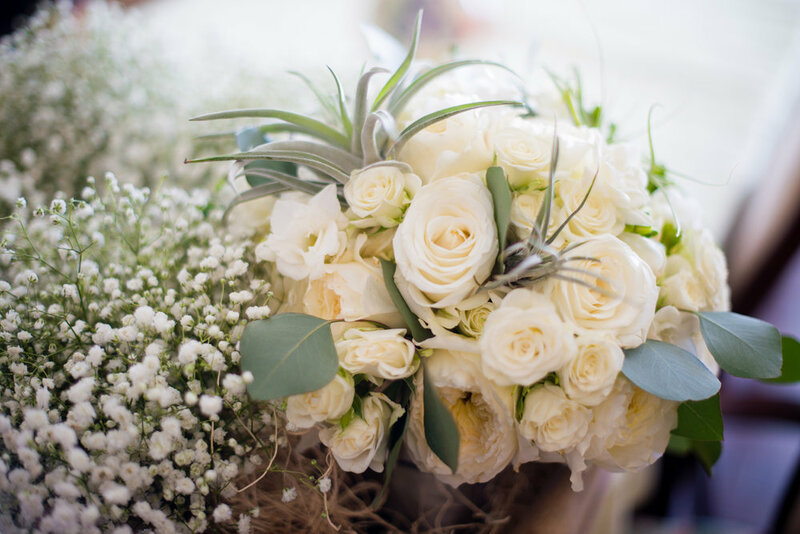 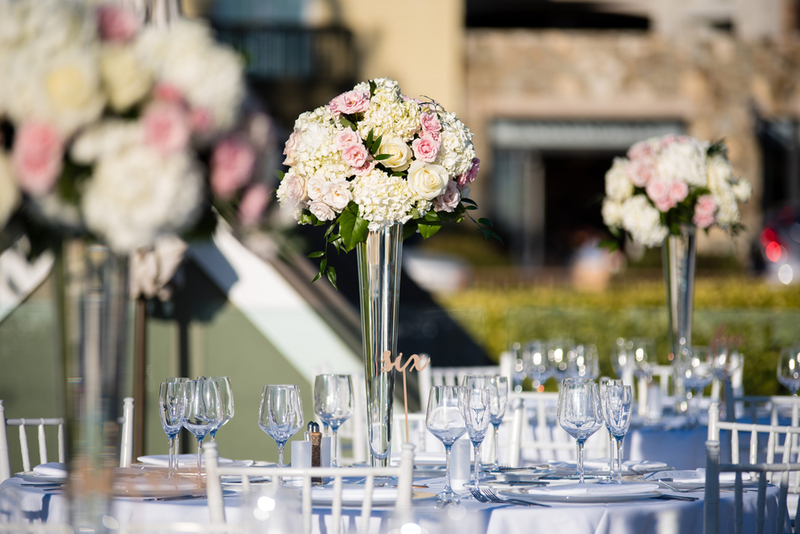 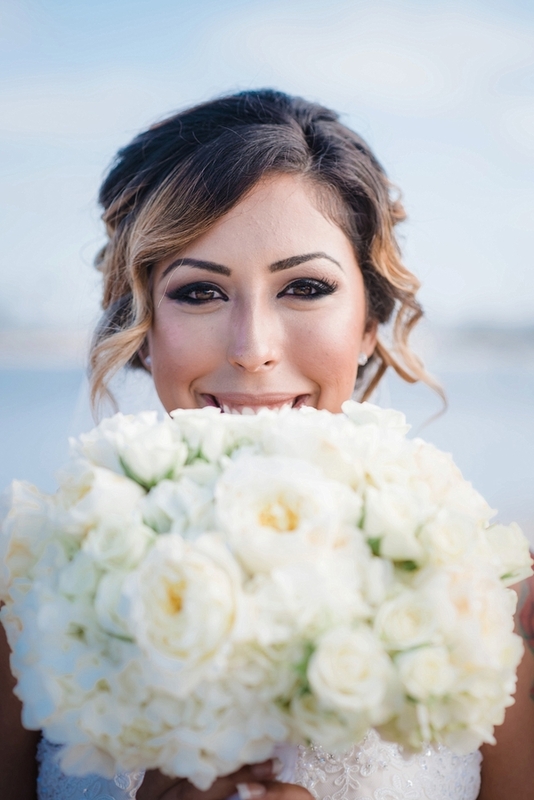 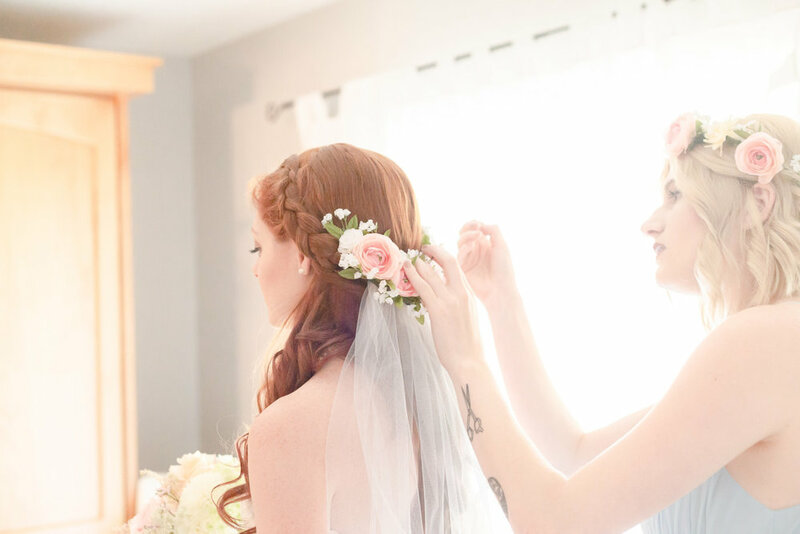 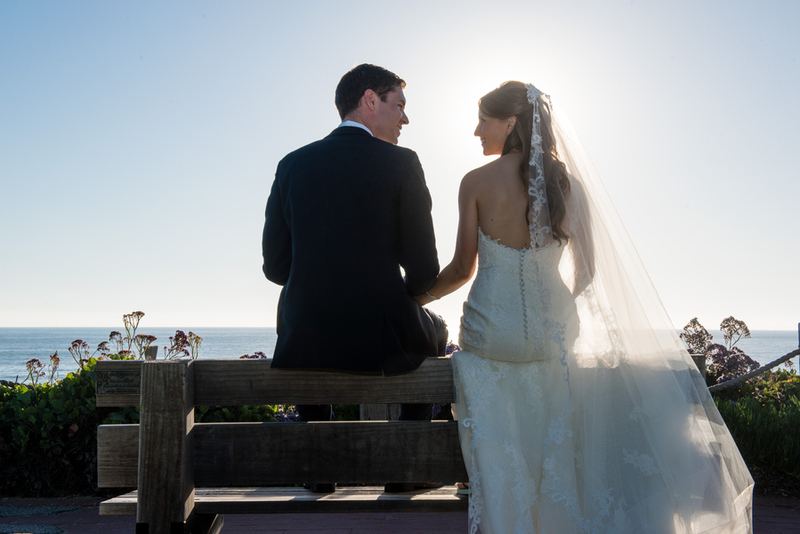 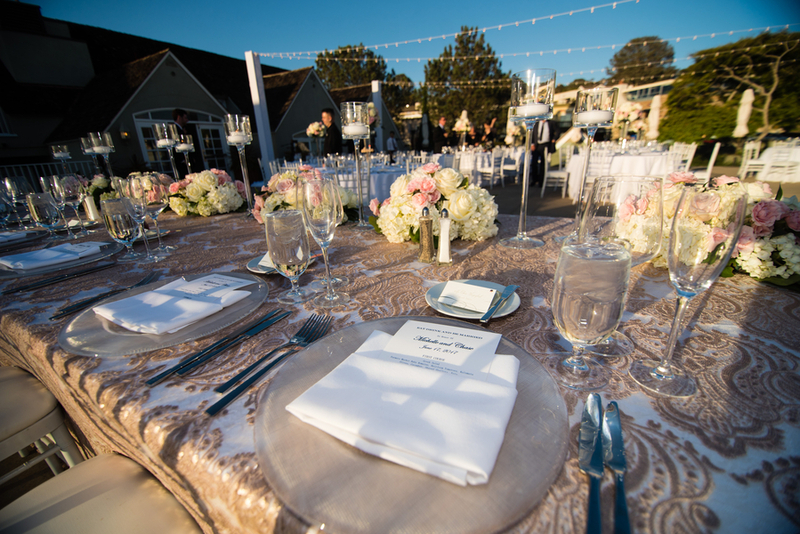 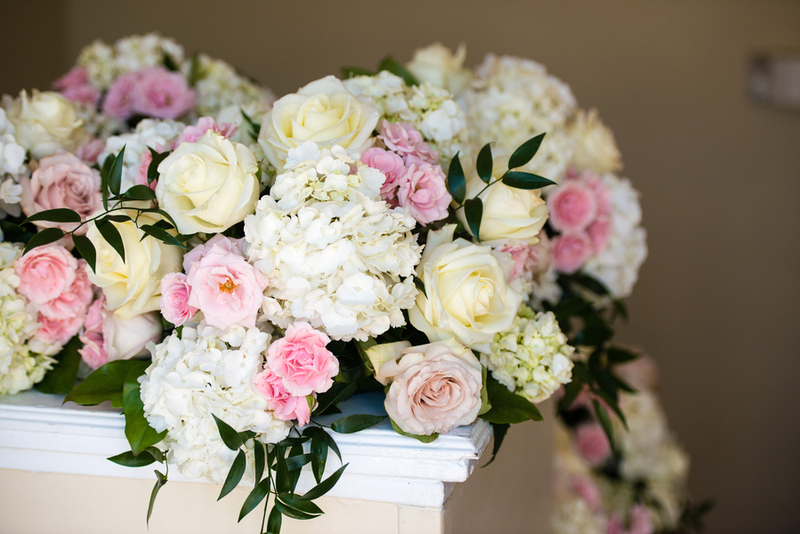 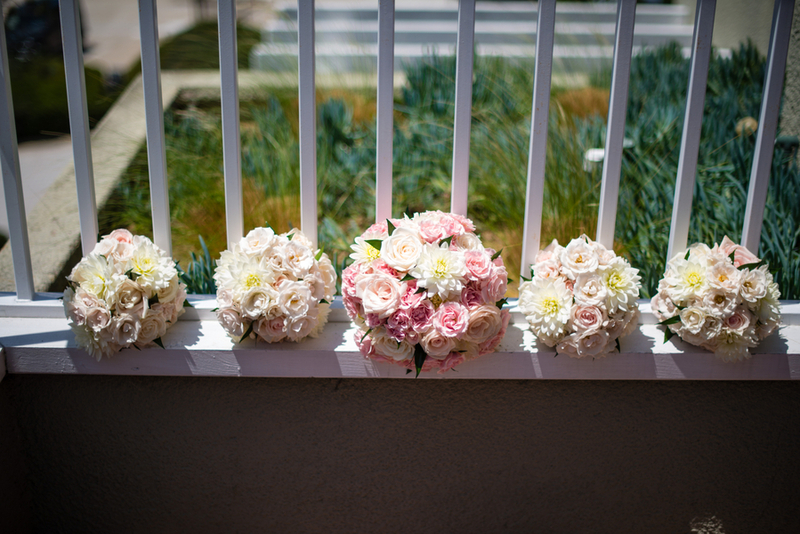 A Del Mar wedding always delivers beauty, charm and style! 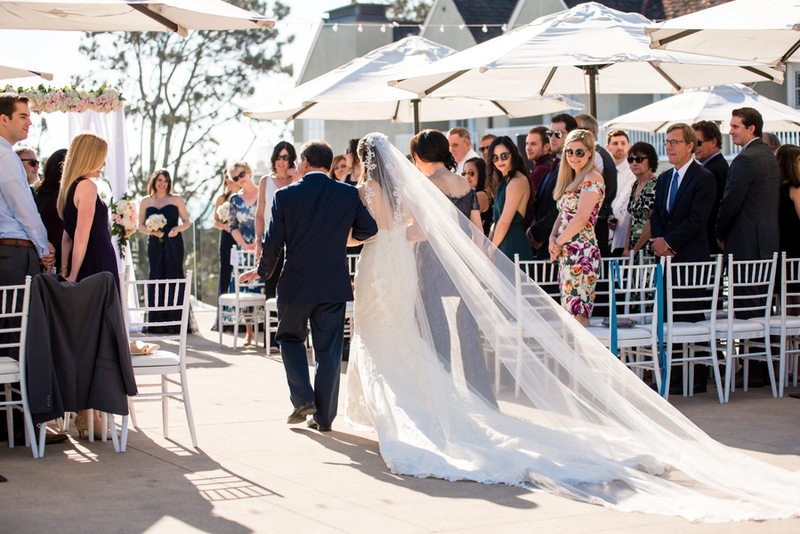 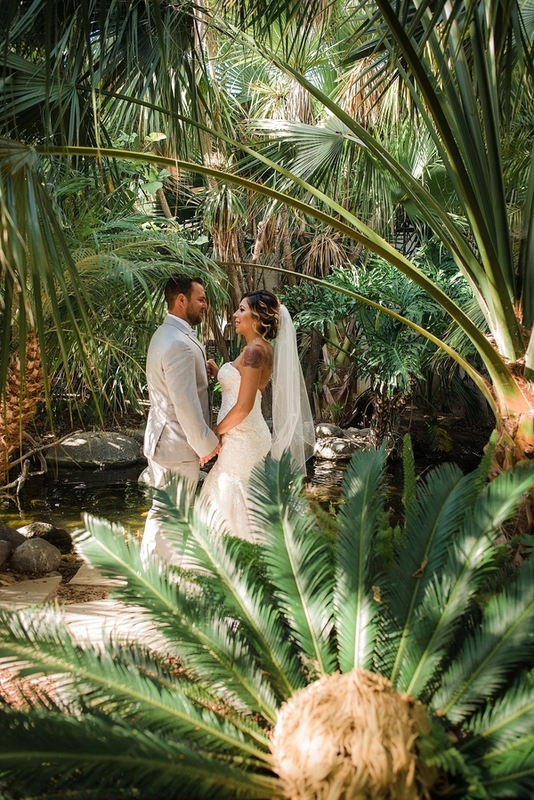 With sweeping views of the ocean from the picturesque ceremony at L'Auberge Del Mar, to the bride's dramatically long train, this couple's special day was romantic with a touch of flair. 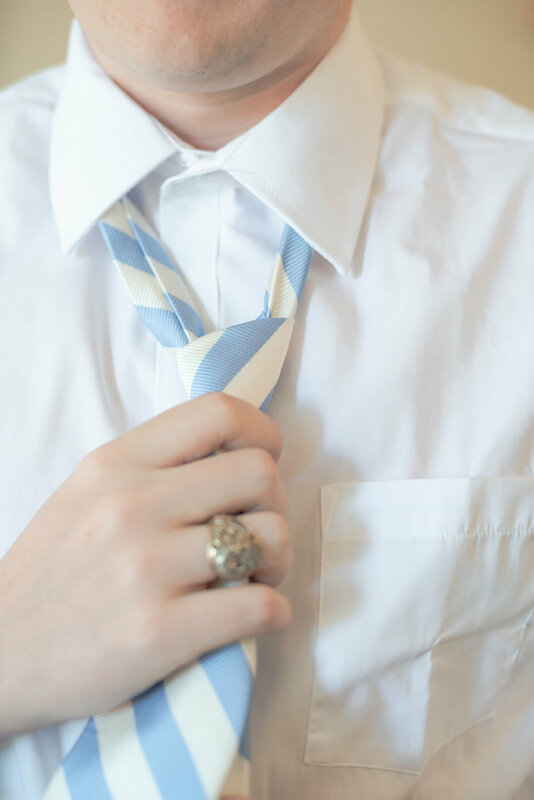 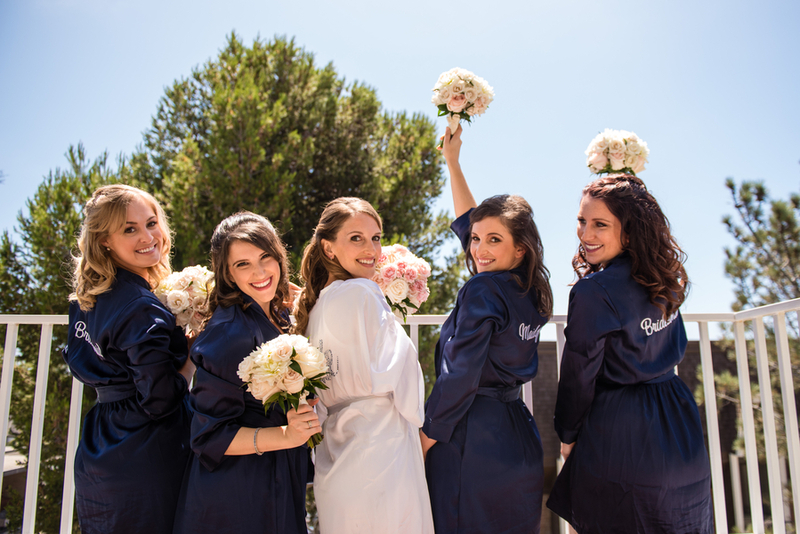 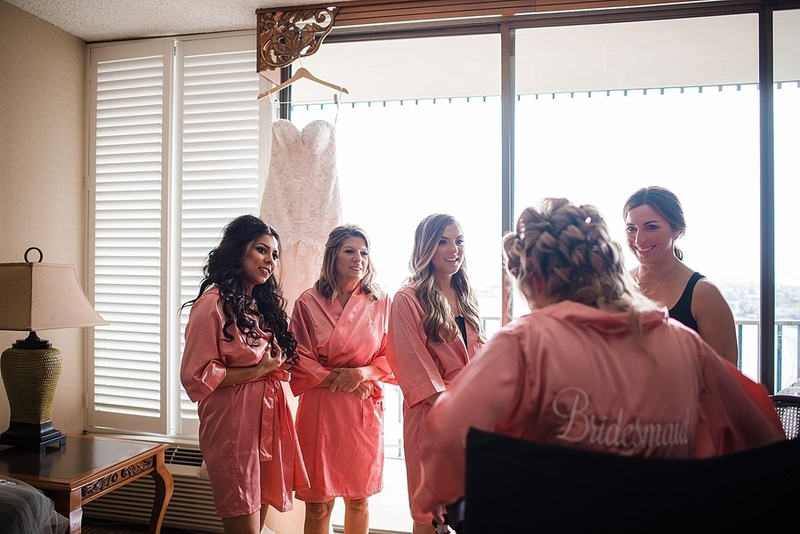 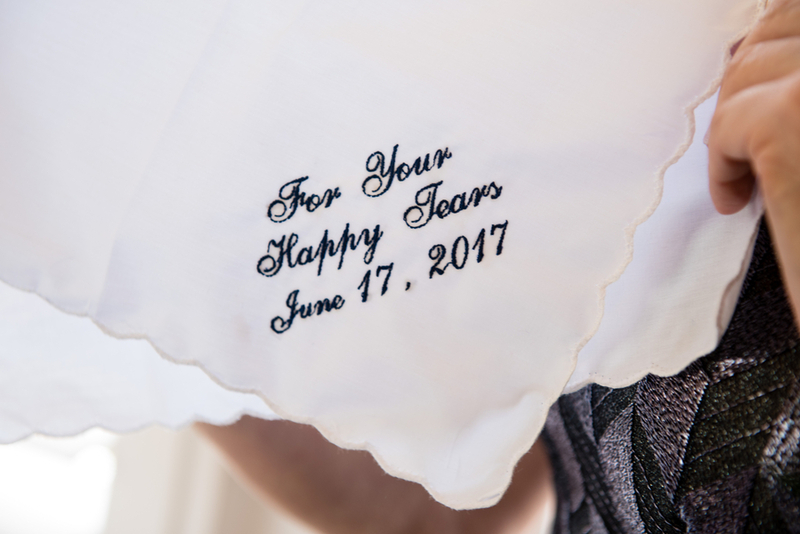 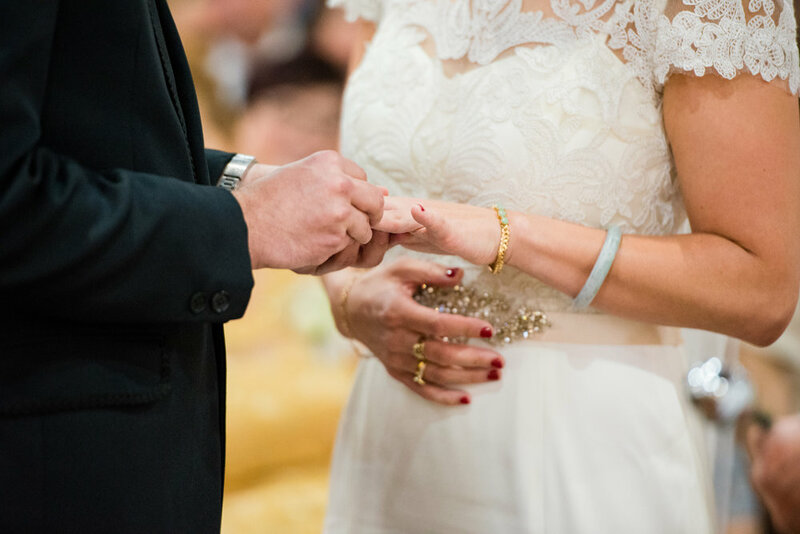 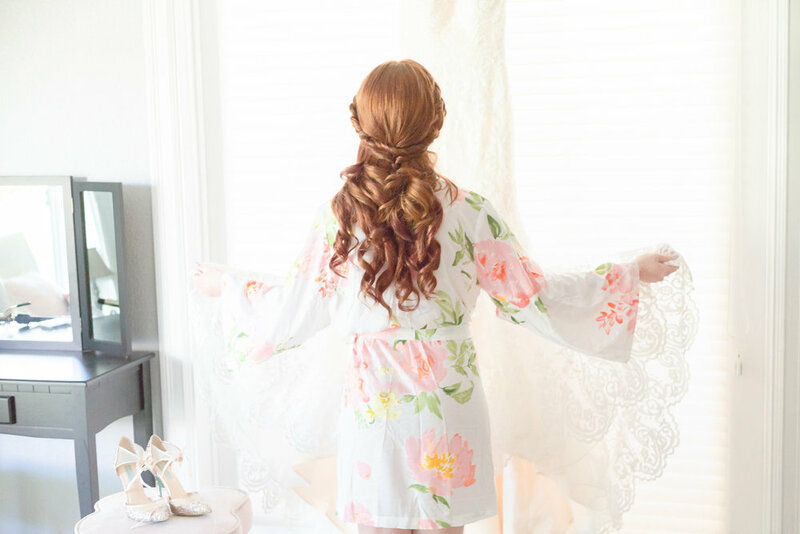 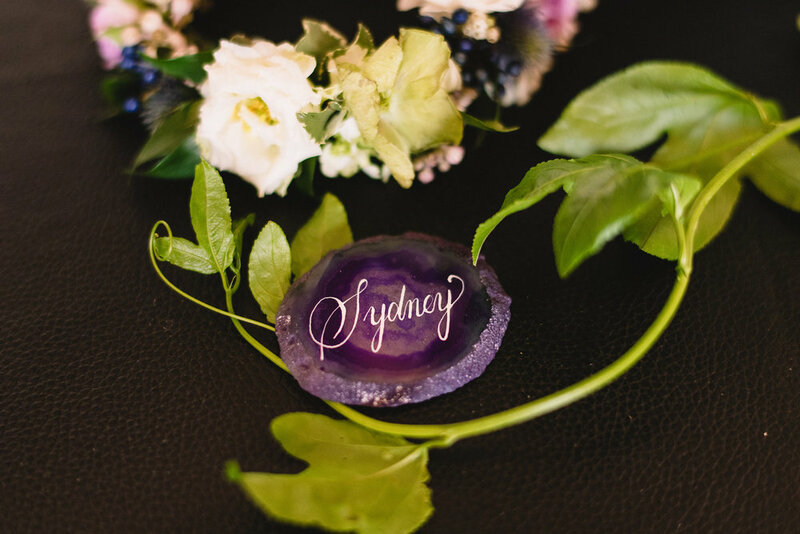 Every little detail was elegant and intimate, with hand sewn handkerchiefs for "happy tears" at the ceremony, personalized robes for the bridal party [trending this year! 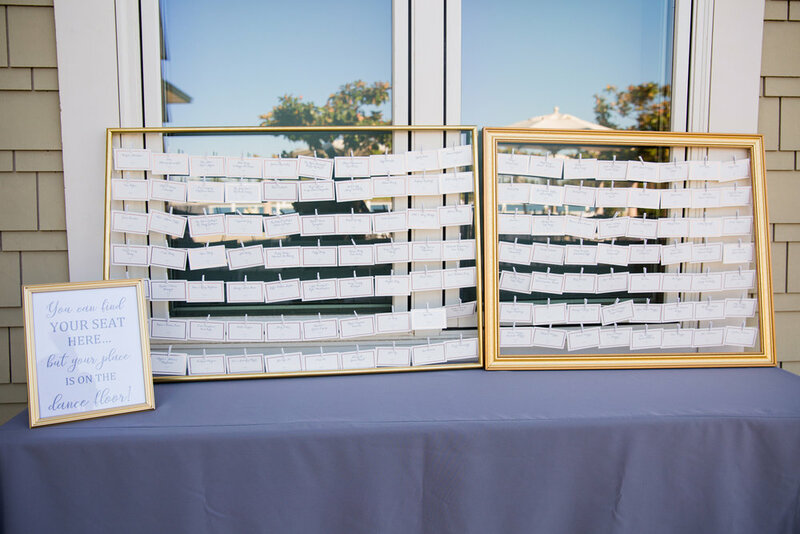 ], and a beautifully embroidered artwork of the couple kissing in front of the Eiffel tower as a centerpiece to the decor. 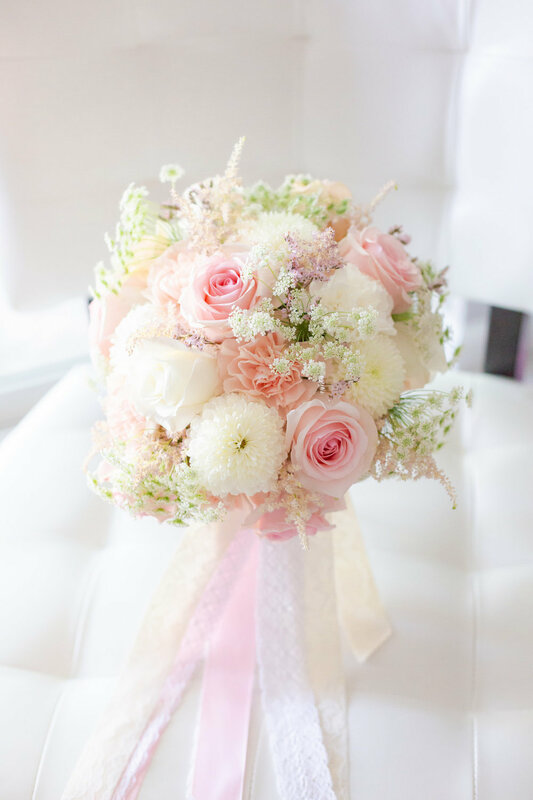 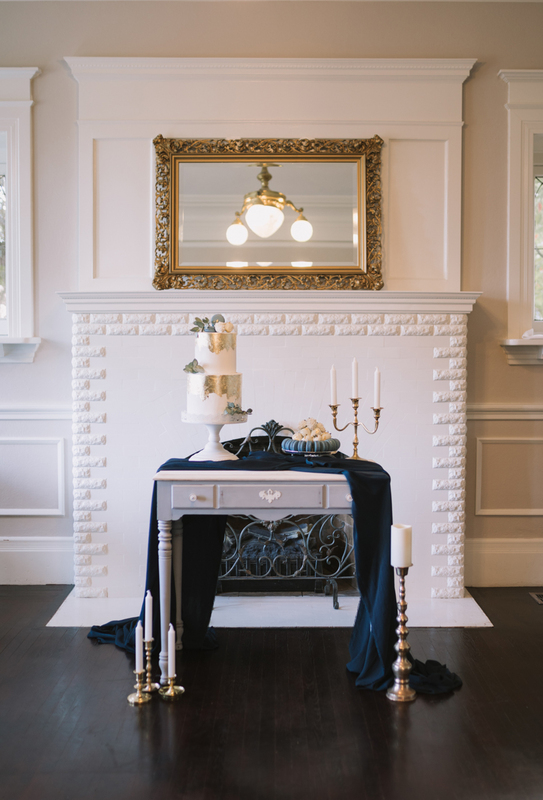 The color palette was sophisticated with shades of navy blue in various textures, blush pink, and a splash of gold. 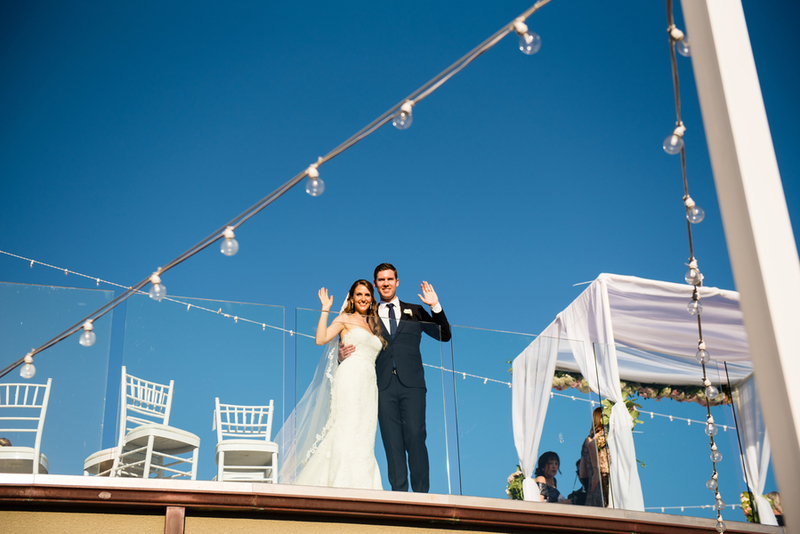 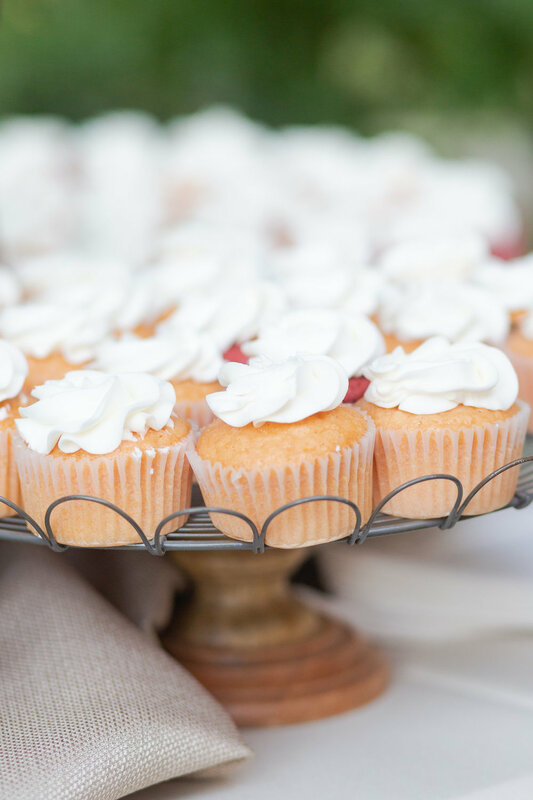 The reception continued on the ocean view rooftop, as the sunset on the ocean, the string of lights hanging above the tables creating a cozy and romantic vibe and then led to world famous VG donuts! 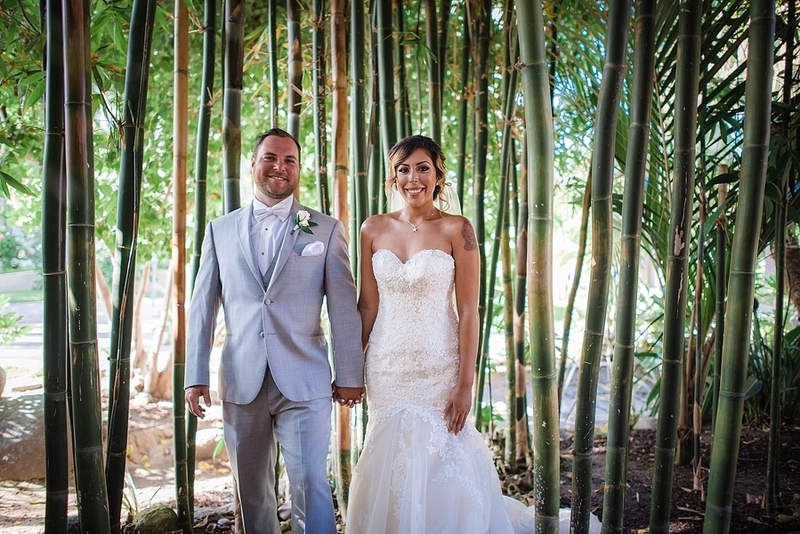 Congratulations to the happy couple! 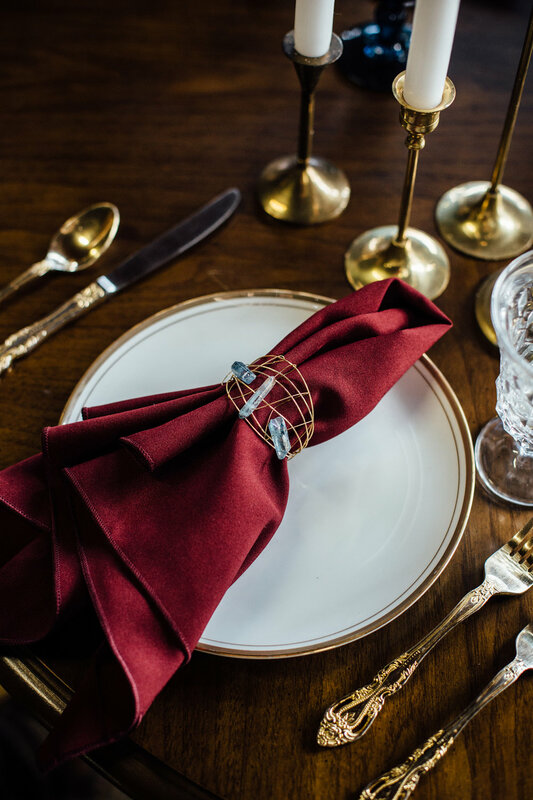 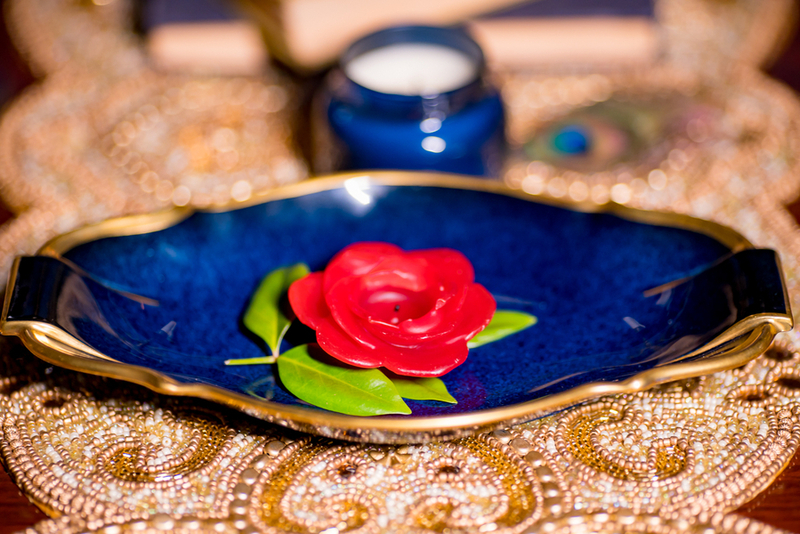 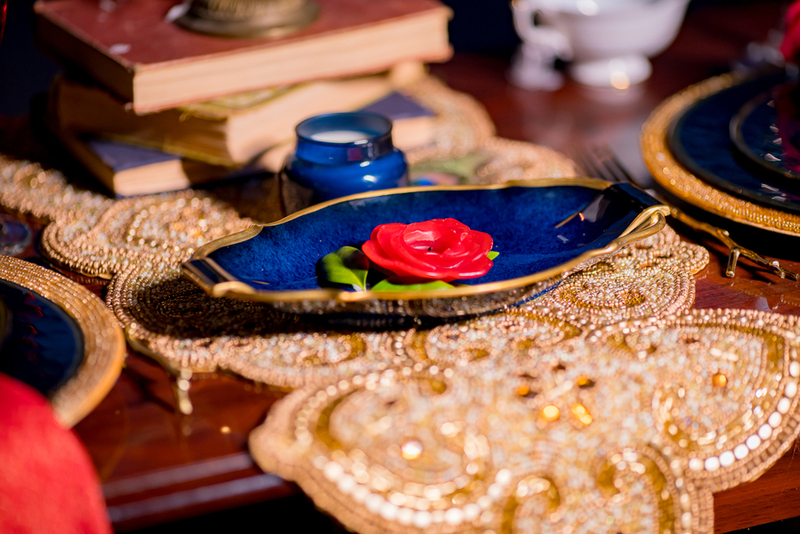 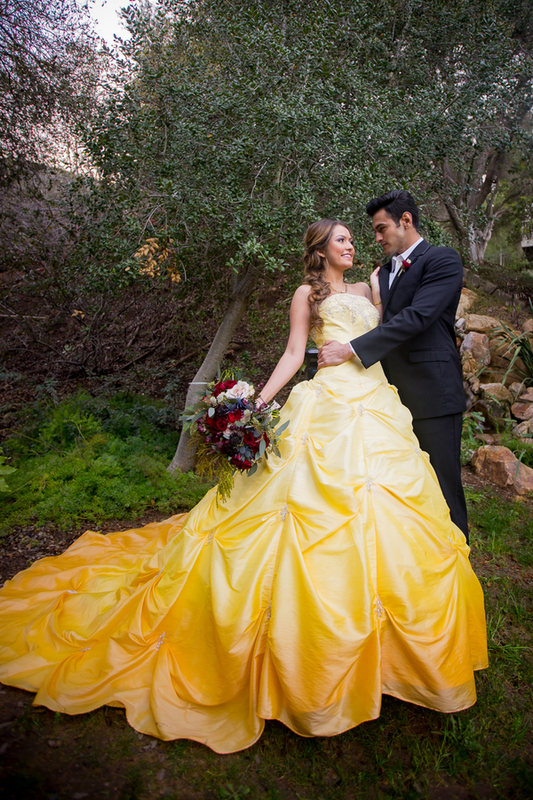 Be our Guest and Enjoy this Beauty and the Beast Wedding Styled Shoot! 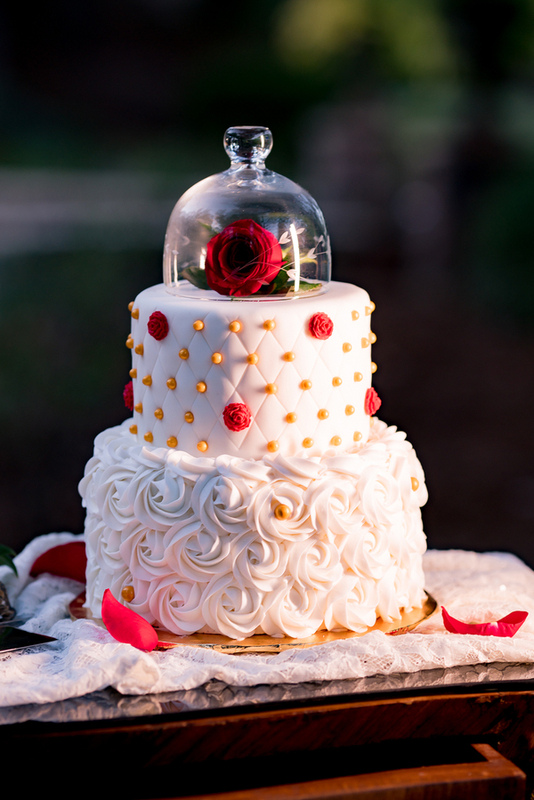 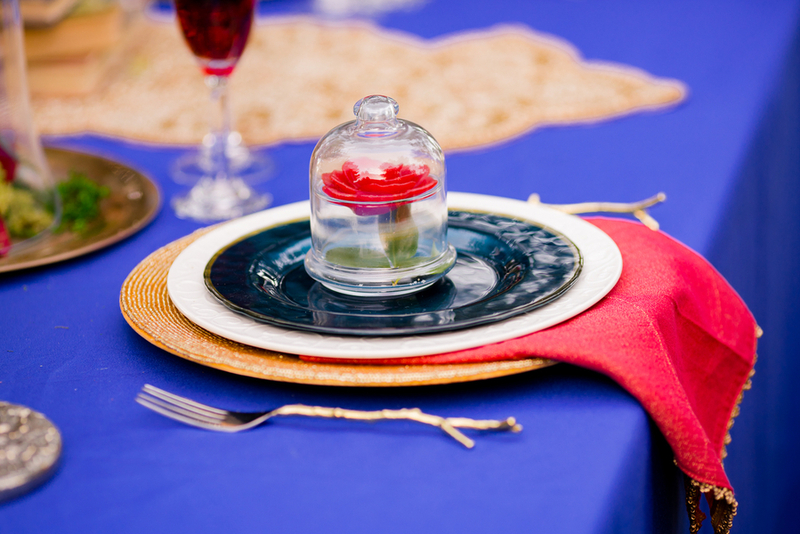 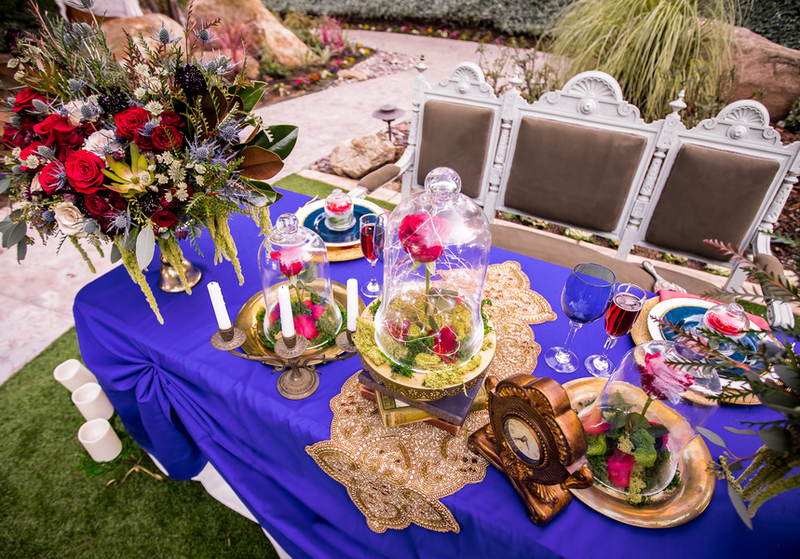 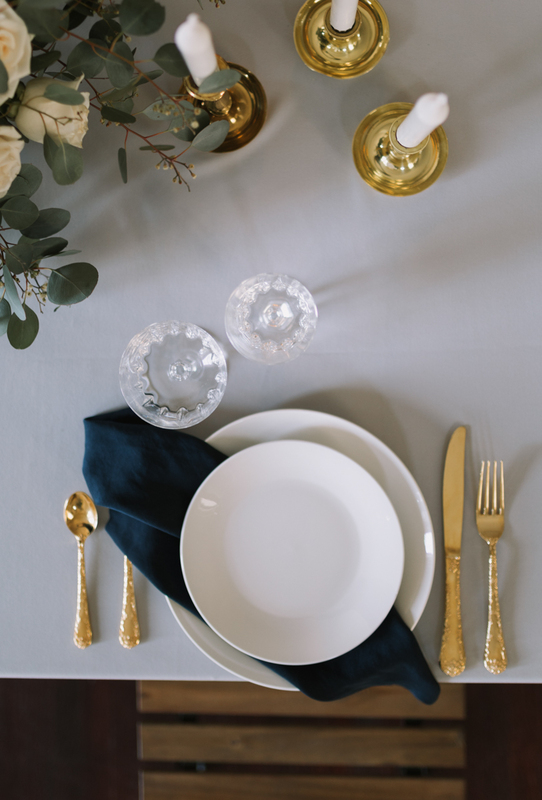 We ask you to "Be Our Guest" and enjoy this adorable Beauty and the Beast styled Wedding Shoot! 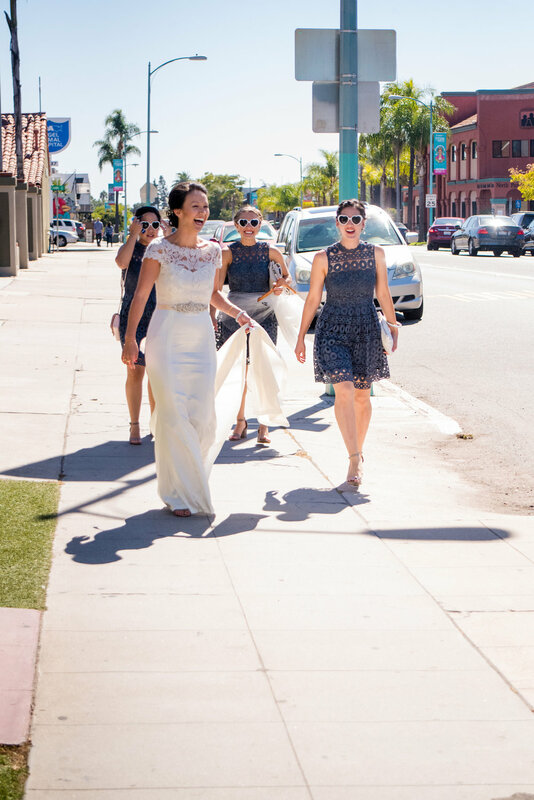 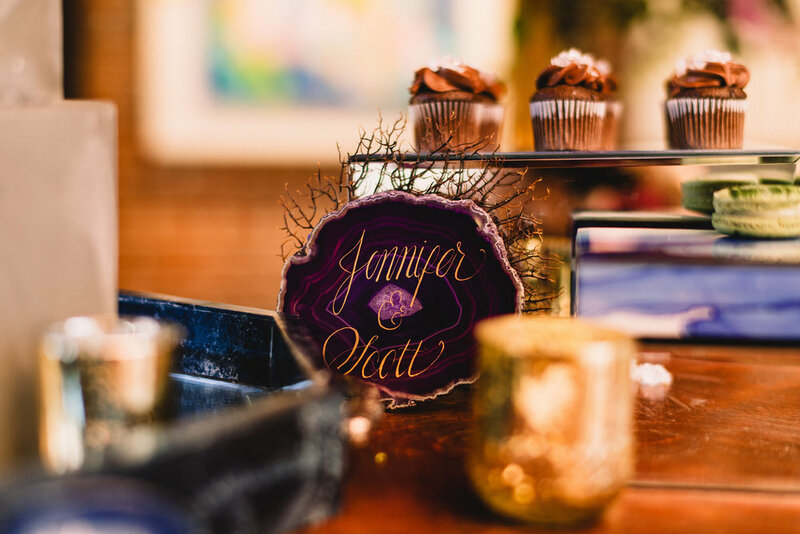 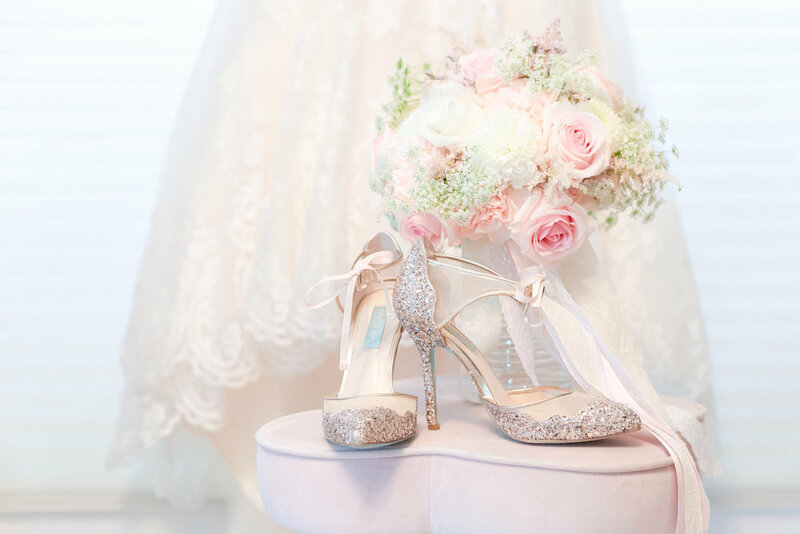 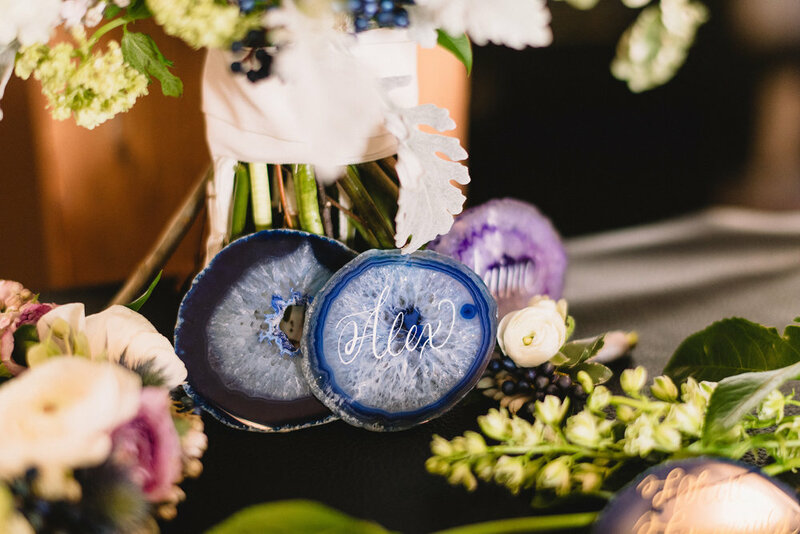 With extra special new additions of charm jewelry, sparkly shoes, rich blue florals, star led lights, and painted wooden signs, you can tell this group had so much fun creating this styled shoot! 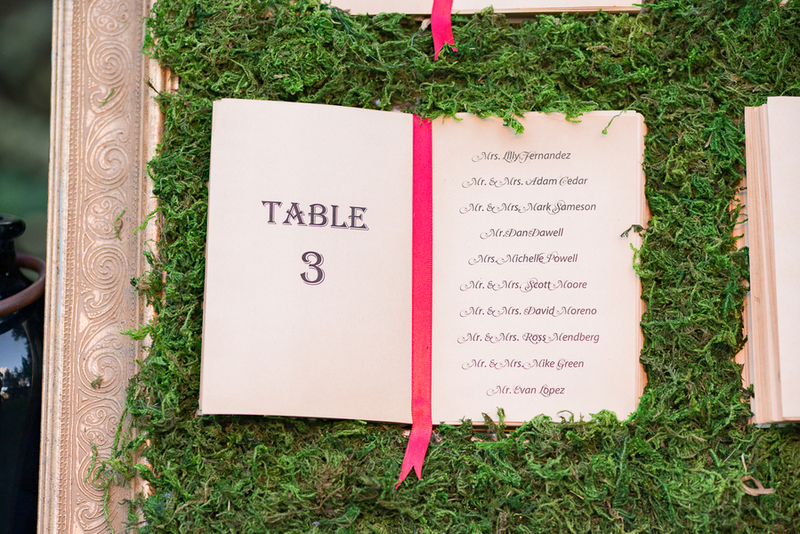 For our part we loved this ode to one of our favorite fairy tales. 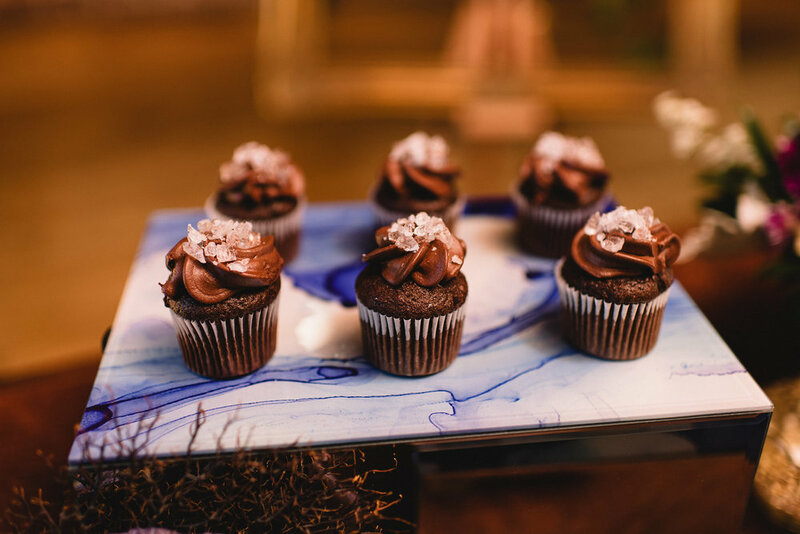 Now back in the cupboard with you Chip! 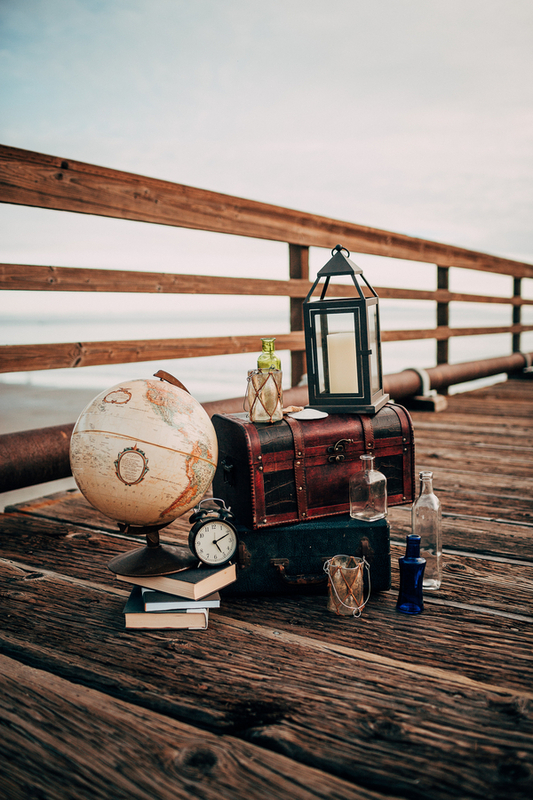 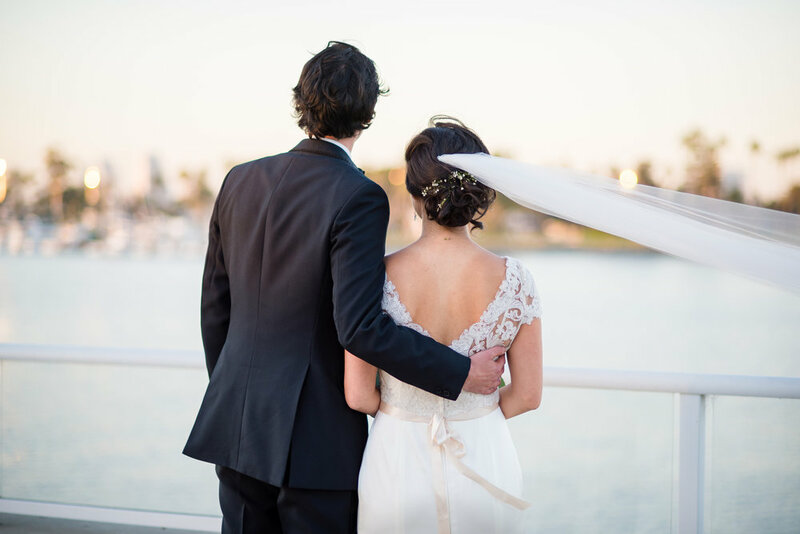 An oceanfront nautical theme wedding styled shoot navigates maritime elements into one lovely day by the sea! 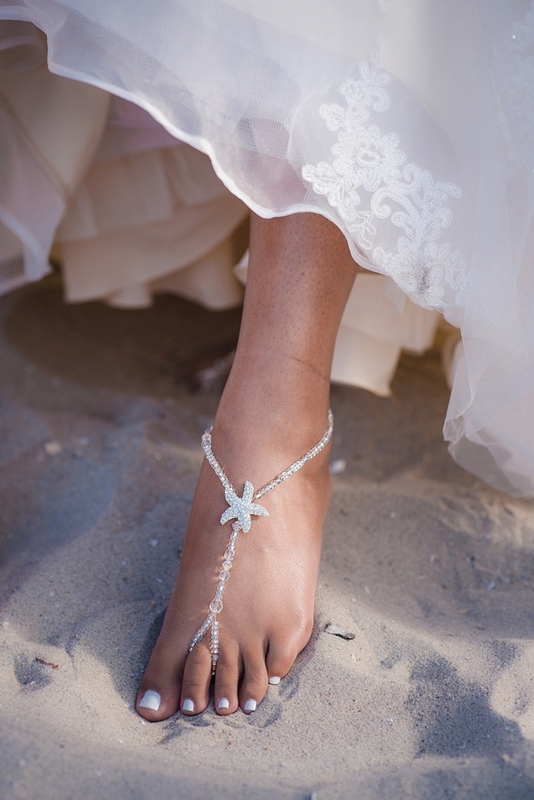 We love seashells by the seashore and when you add in two people in love with their love for the ocean you get a truly nautical affair. 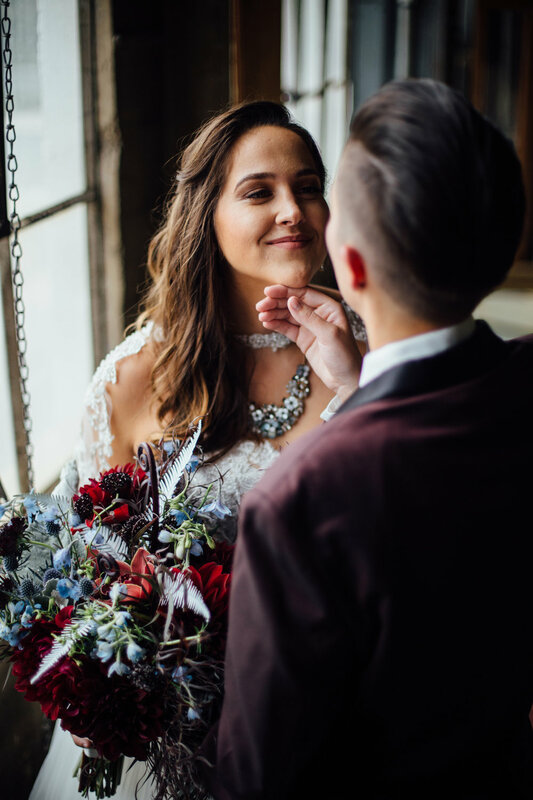 Sophia and Rado met on a cruise line where they both worked, fell in love and traveled the world together so this real couple's styled shoot had to reflect their love of the sea. 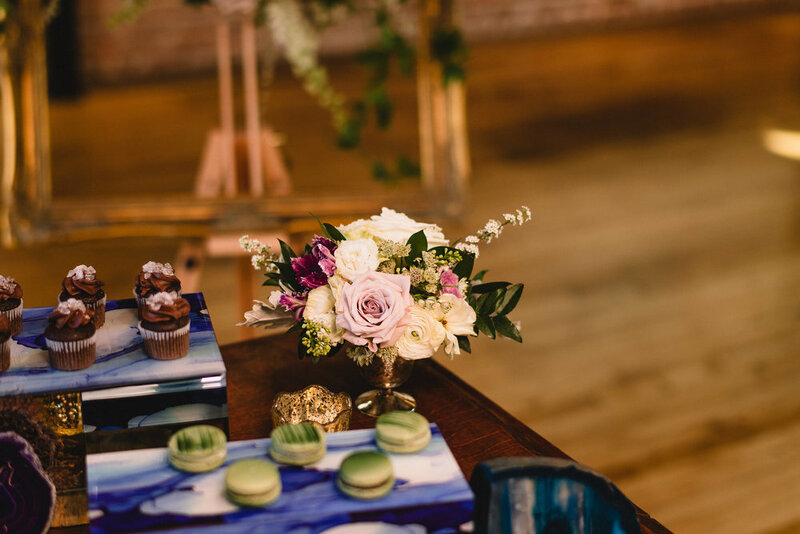 With natural elements of seashells and sea life with globes and colored glass, this wedding styled shoot has these two ocean lovers floating away in a vessel of love like the fabled Owl and the Pussycat! 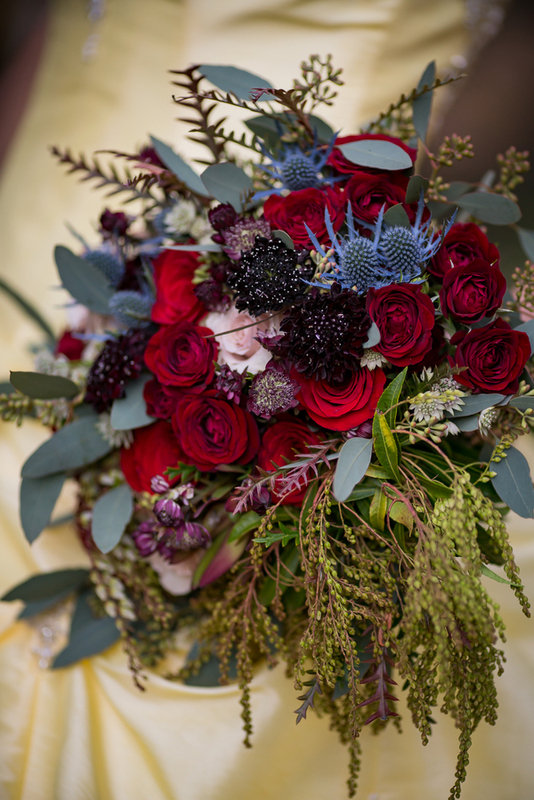 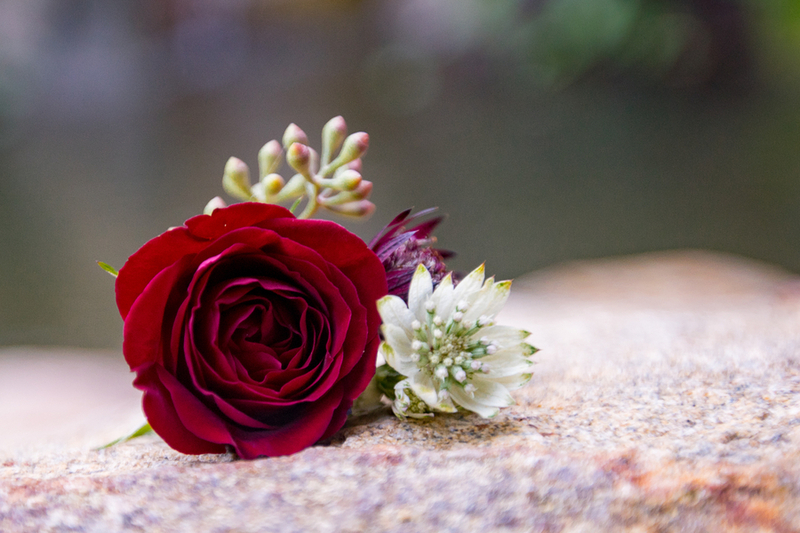 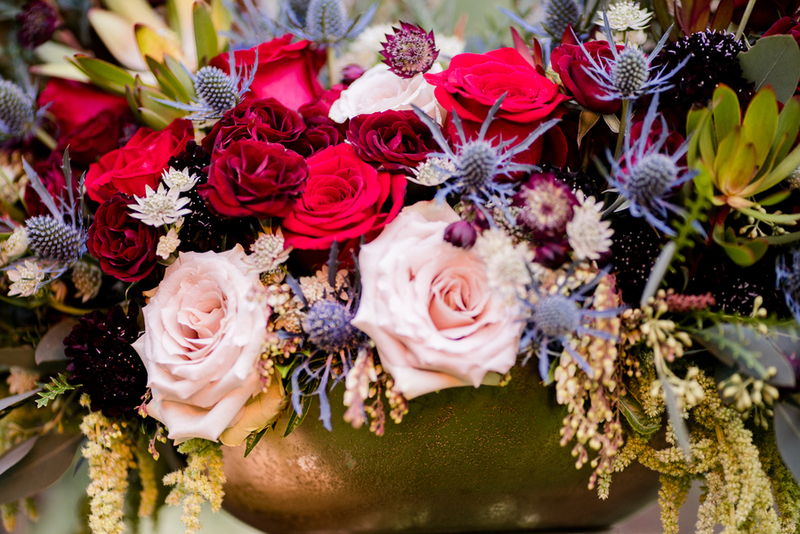 Deep garnet red and that lovely thistle of periwinkle blue make a stunning bouquet by Black Lotus Florals captured by Great Woodland Photography. 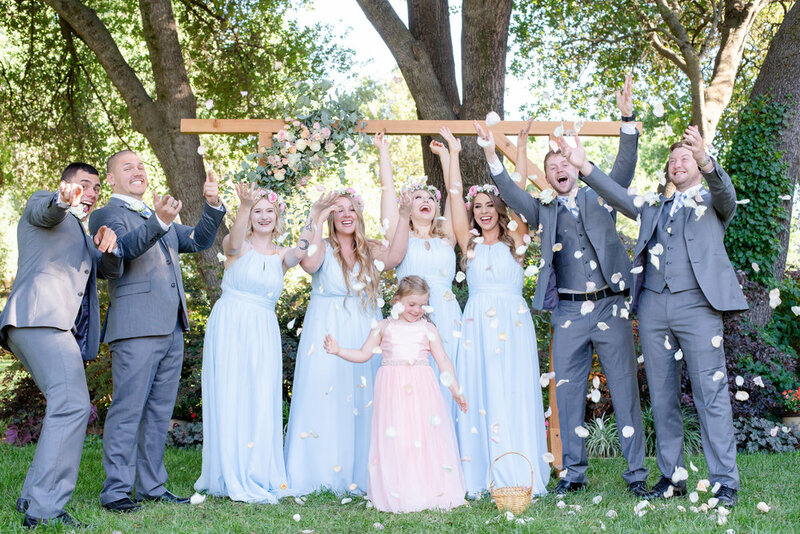 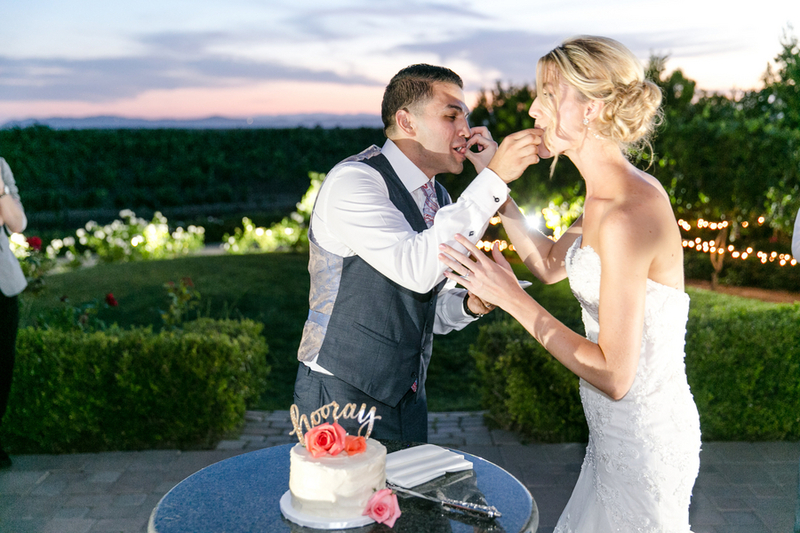 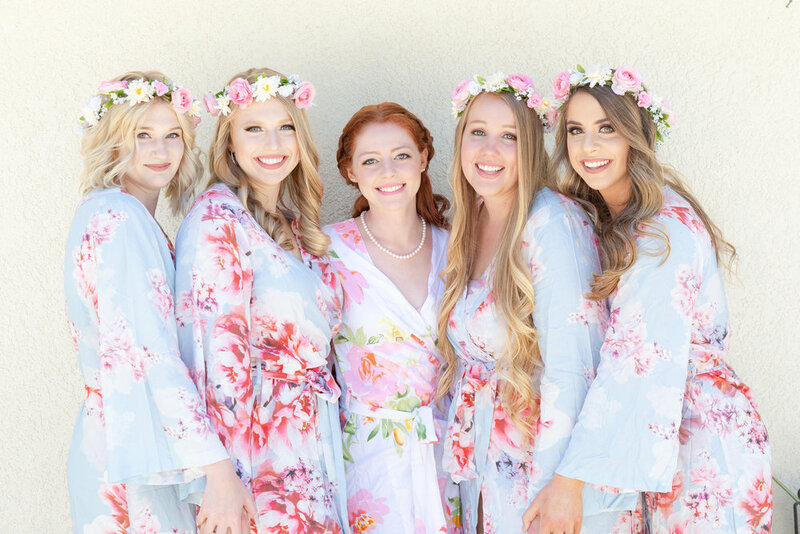 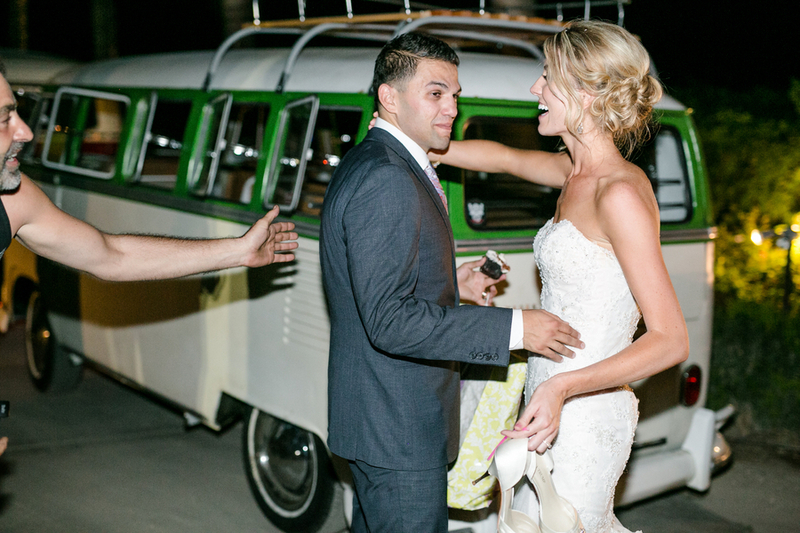 From bright orange florals and bridesmaids, to indigo suits and paisley ties, add in a darling mint green VW bus, gorgeous vintage rental elements and an eye popping view and you get this Wine Country Wedding in Southern California's Temecula Valley that really stands out for its style and color! 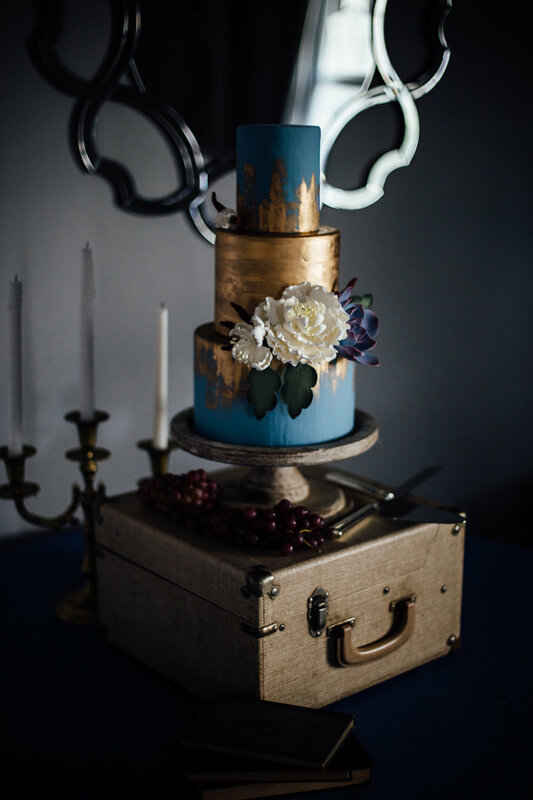 "Let them eat cake" she said and this time we agree! 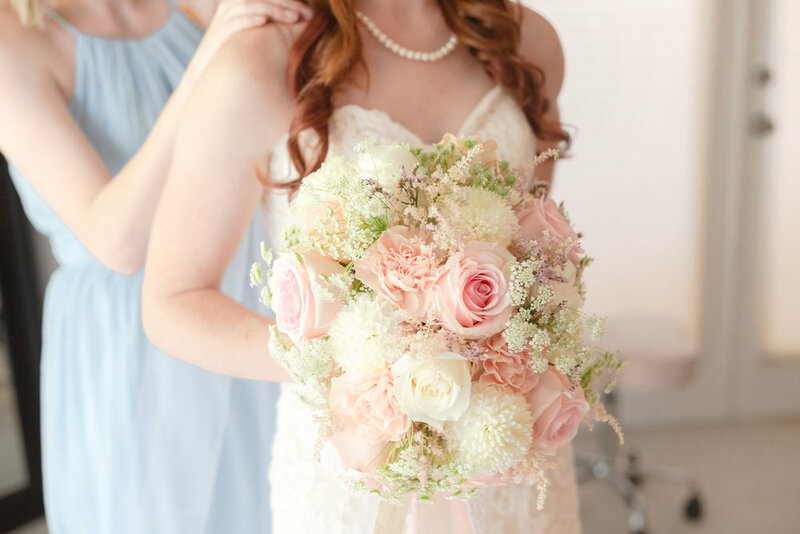 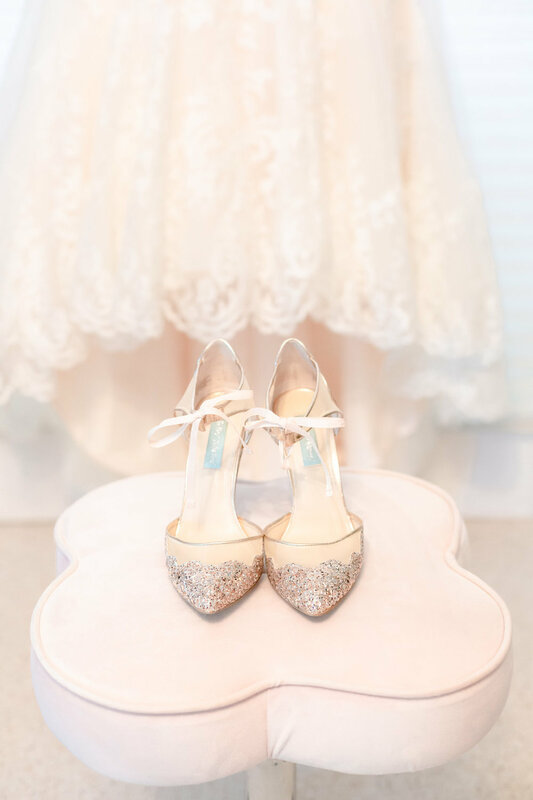 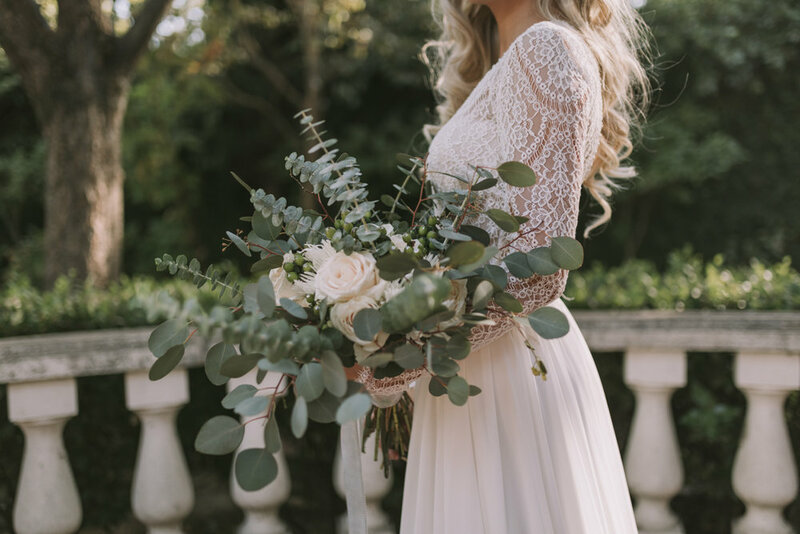 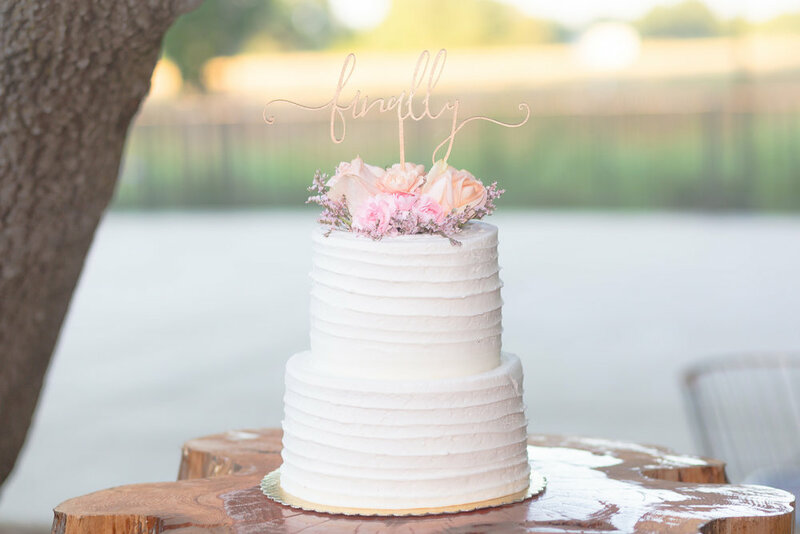 We love this pastel colored "Marie Antoinette" wedding styled shoot that showcases some queenly style and delicious and dreamy Michelle Hebert Bridal Gowns! 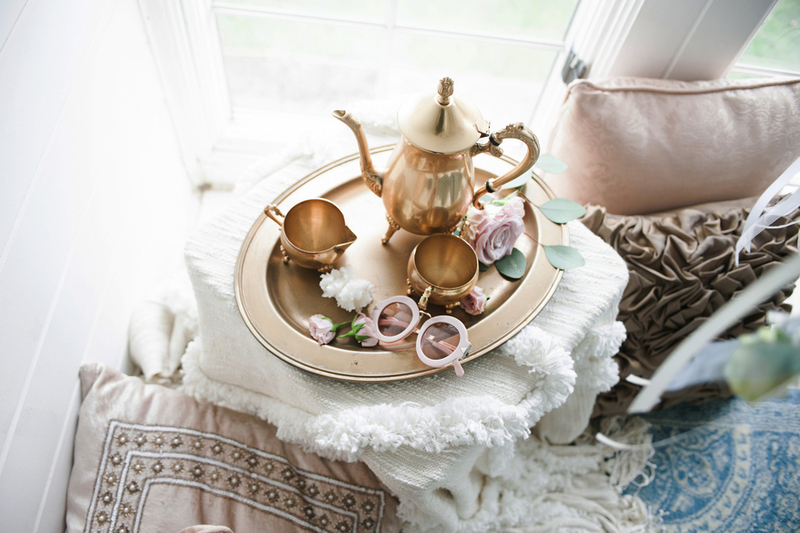 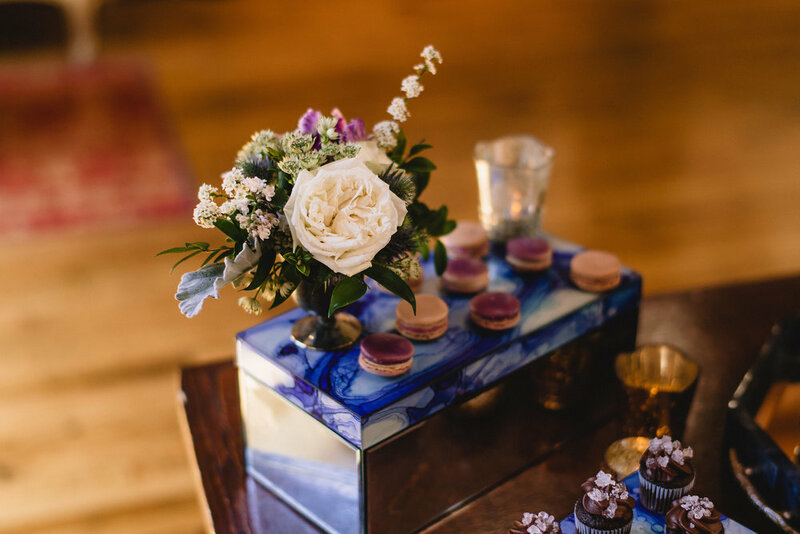 This over the top styled shoot is just the right sweet spot with fun mode styling with pinks and blues and roses and crystals and macarons and beautiful decor that we're sure extravagant Marie would've adored! 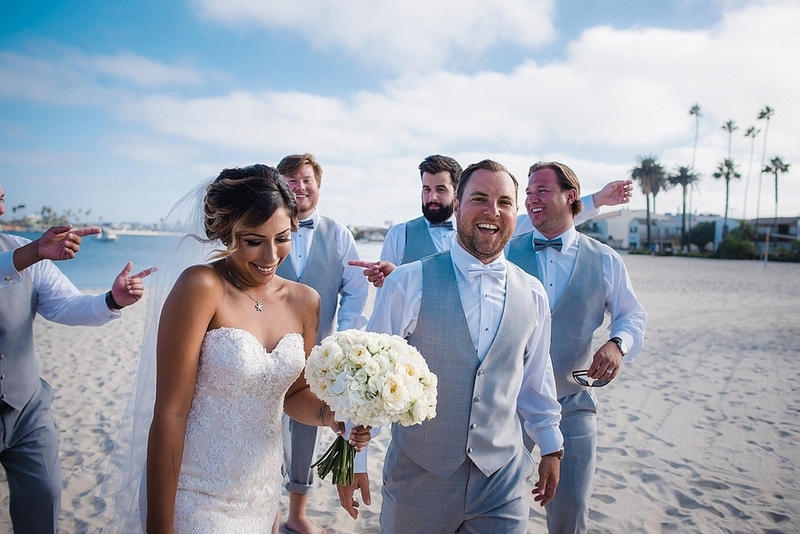 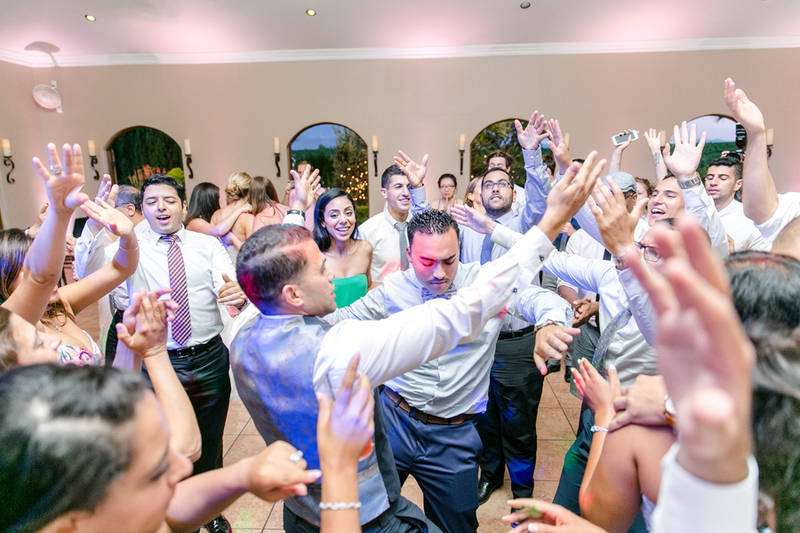 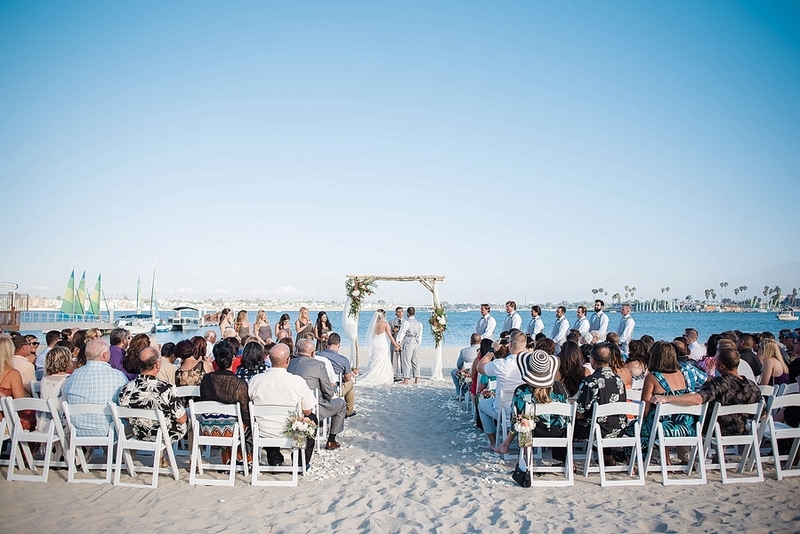 The Catamaran Resort Hotel & Spa in the beachside community of Pacific Beach, San Diego is the perfect spot for a couple looking for a sunny, vacation feeling, tropical style wedding. 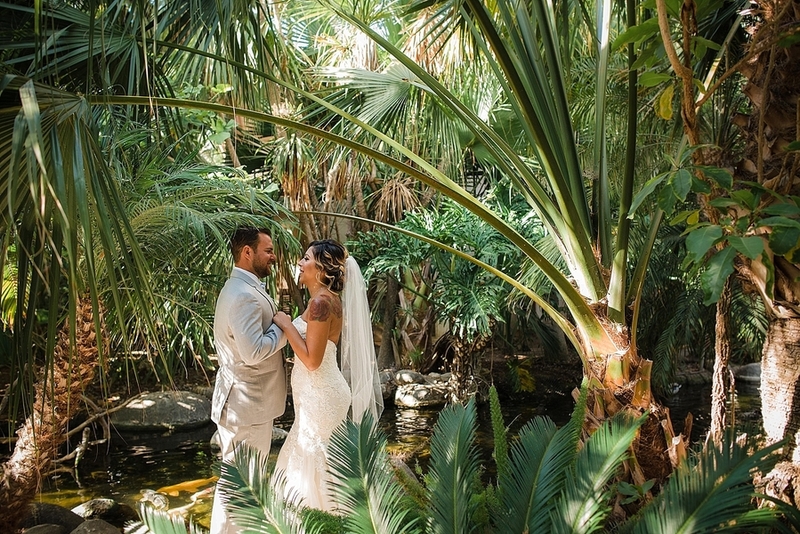 The resort's two-story waterfall in the lobby make for an inviting start to a fun filled day for guests and wedding party alike, not to mention their lush gardens that even include live parrots. 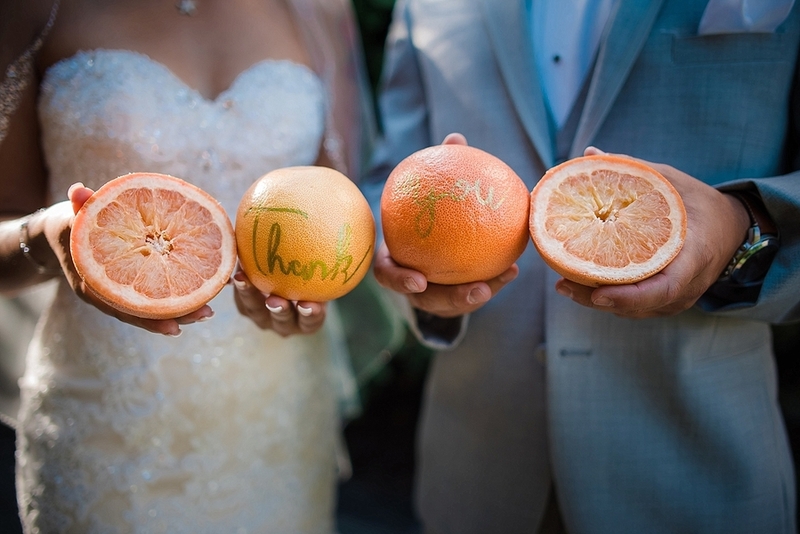 Tasha and Mike had a beautiful first look which was followed by a sunset ceremony on the beach and their happy guests loved the tropical [grapefruits!!] 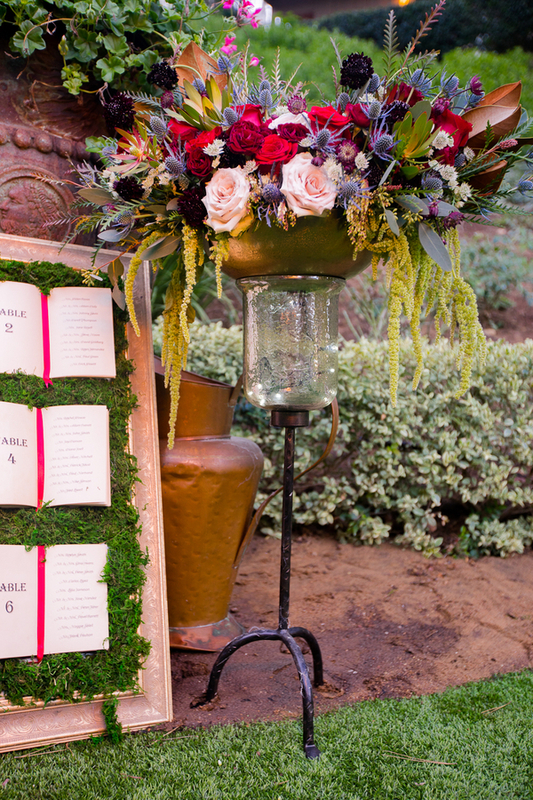 theme that was carried all the way into the ballroom for the reception.